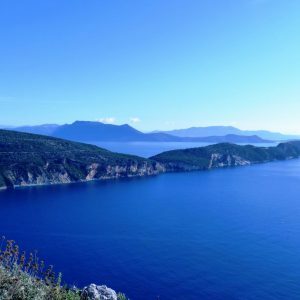 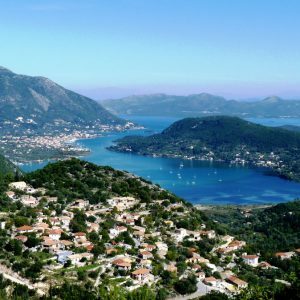 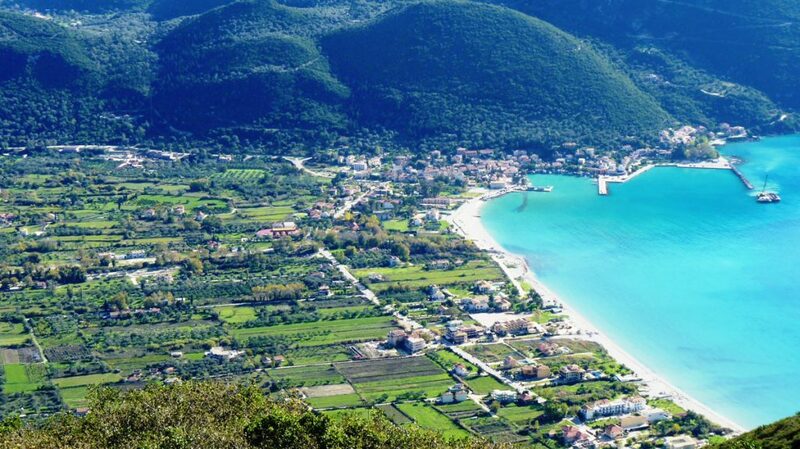 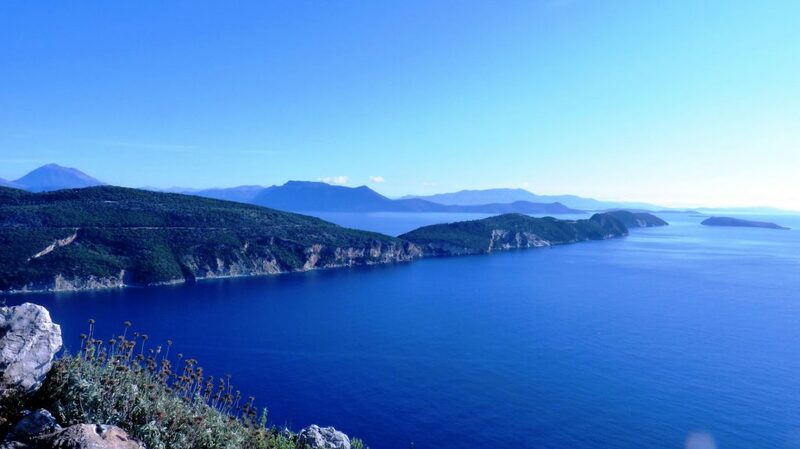 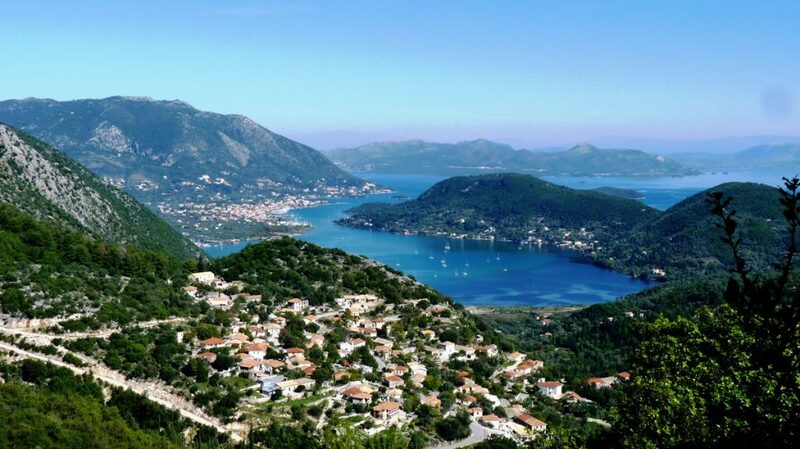 Your walking holiday in Greece will be set on the scenic island of Lefkada in the Ionian. 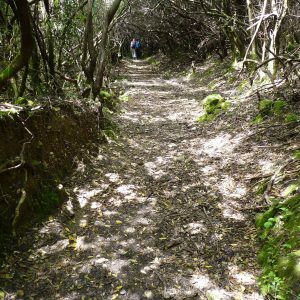 The island still holds on to its traditional customs and maintains its natural environment, a true paradise for hiking! 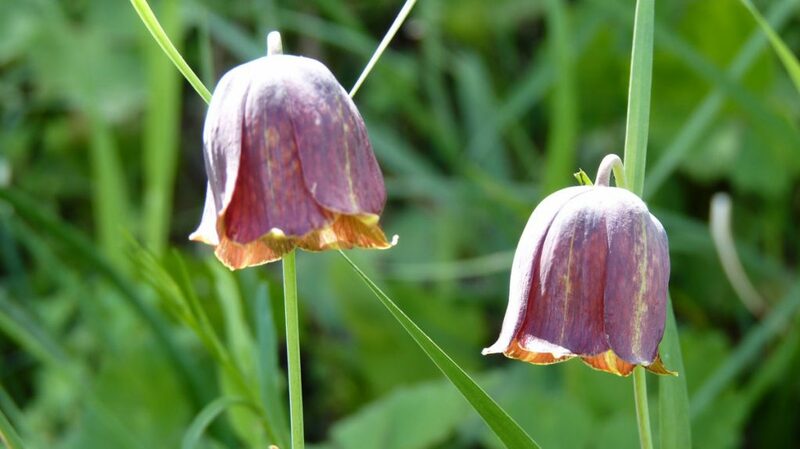 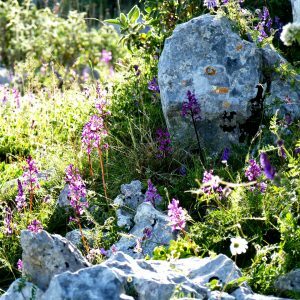 The mountains and the valleys are carpeted in wild flowers and herbs, perfuming the paths we walk. 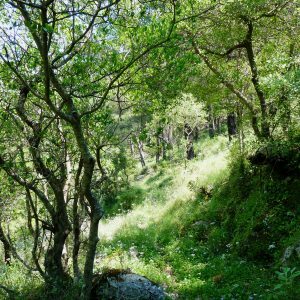 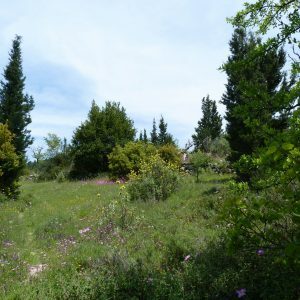 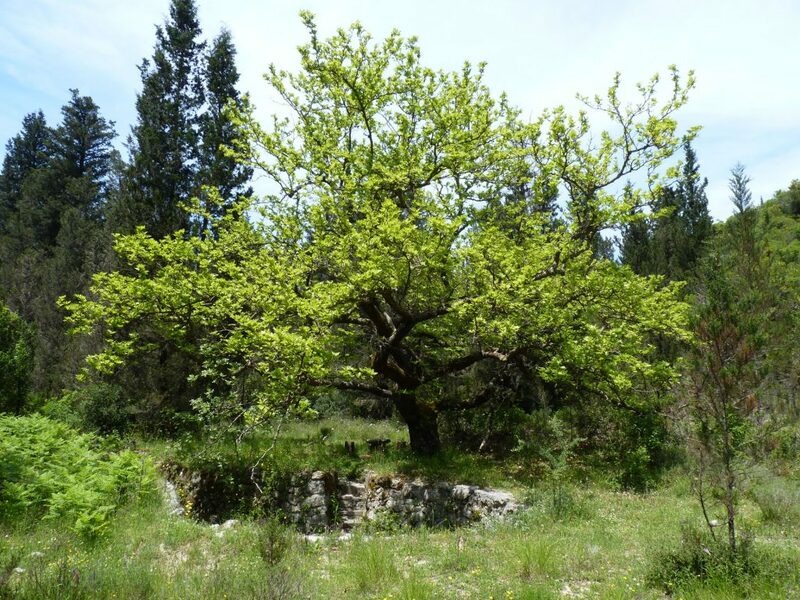 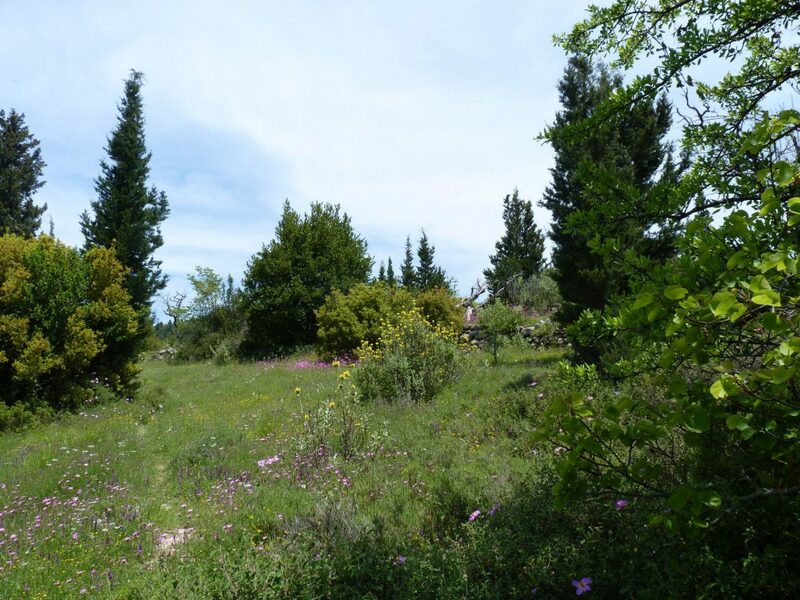 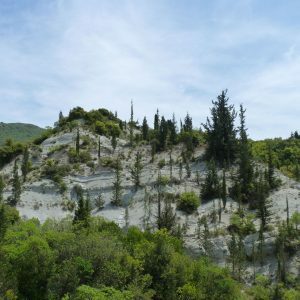 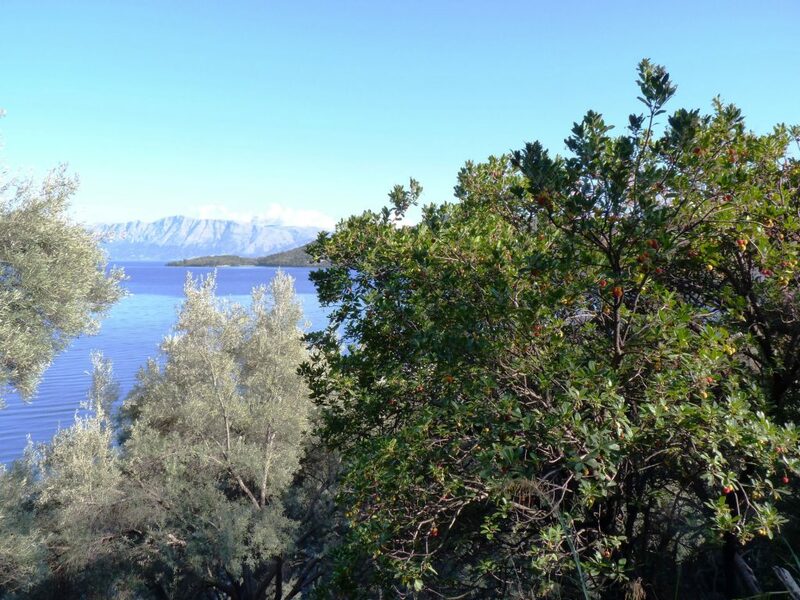 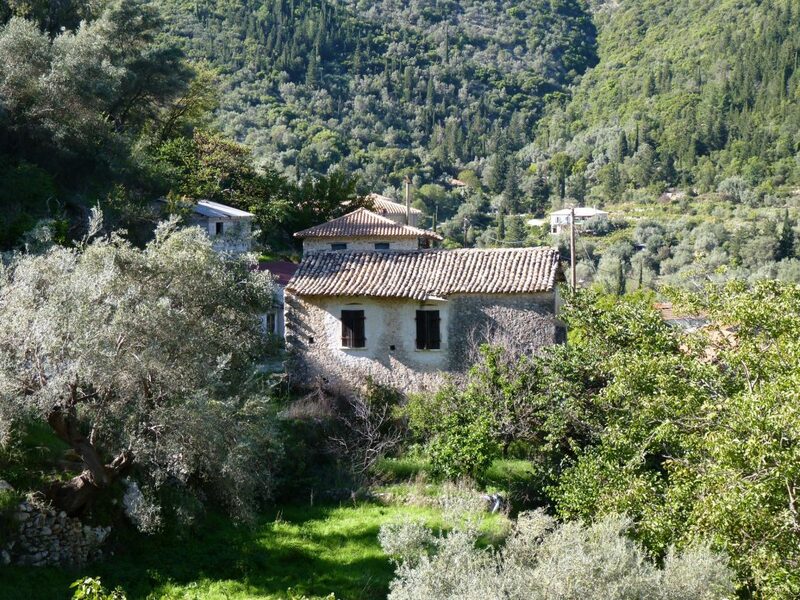 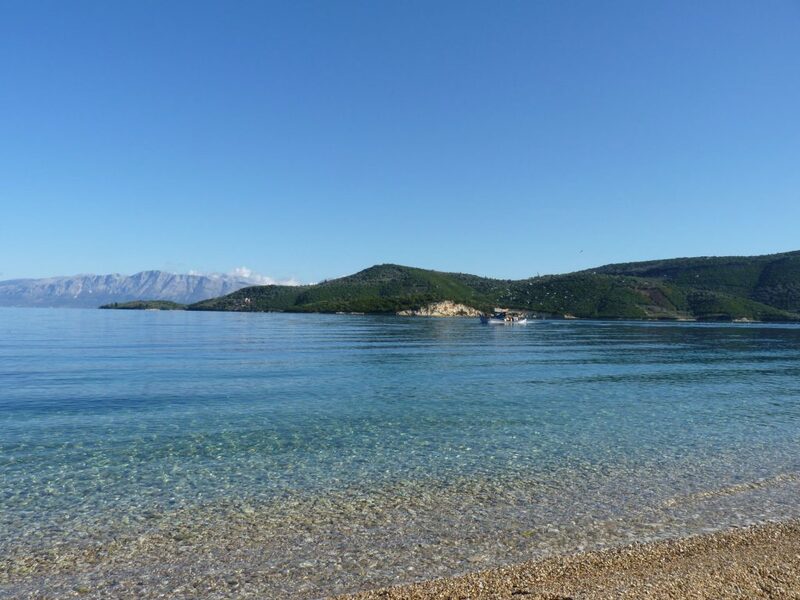 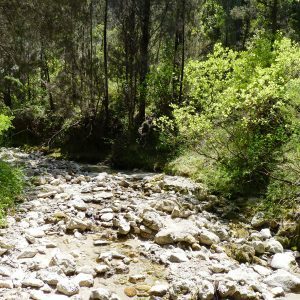 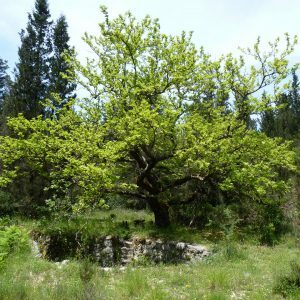 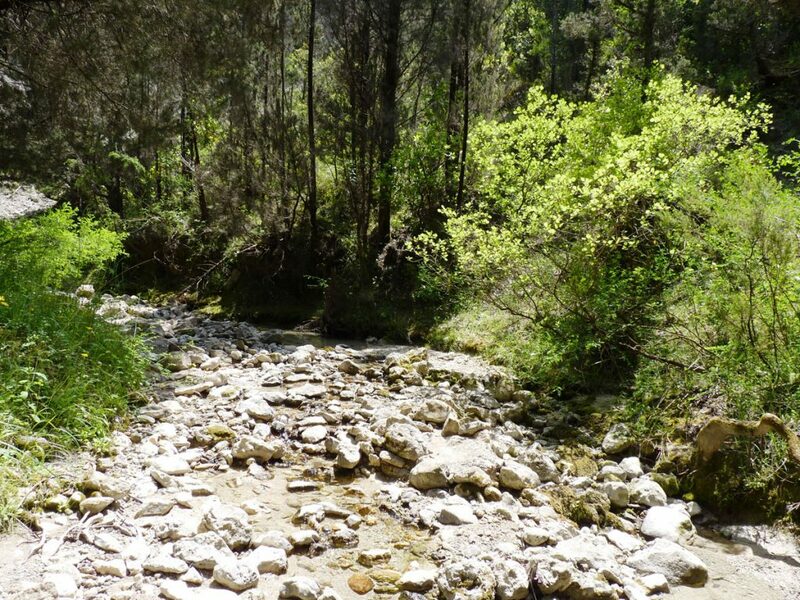 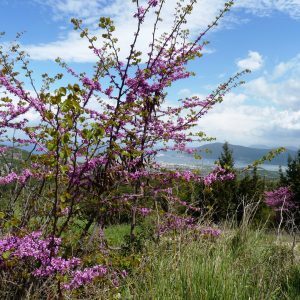 We will come across natural springs that feed the evergreen and deciduous trees and plants that cover Lefkada island and the wider Western Greece region. 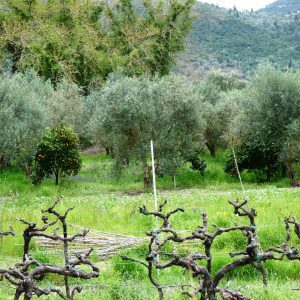 We will pass through villages that still live with the rhythm of their agricultural activities such as lentil, grape and olive harvests. 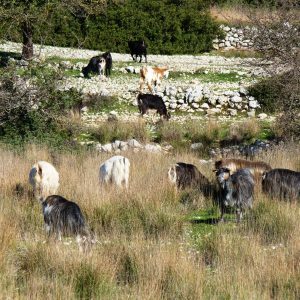 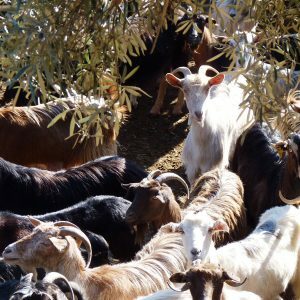 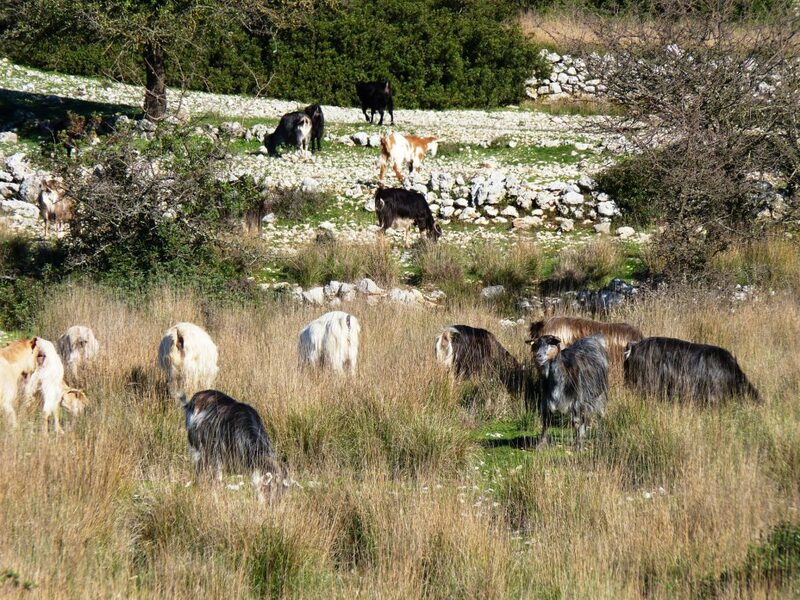 We will see domesticated animals such as sheep and goat herds, sometimes cows and on occasion a donkey either laden or grazing. 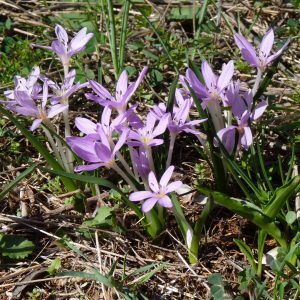 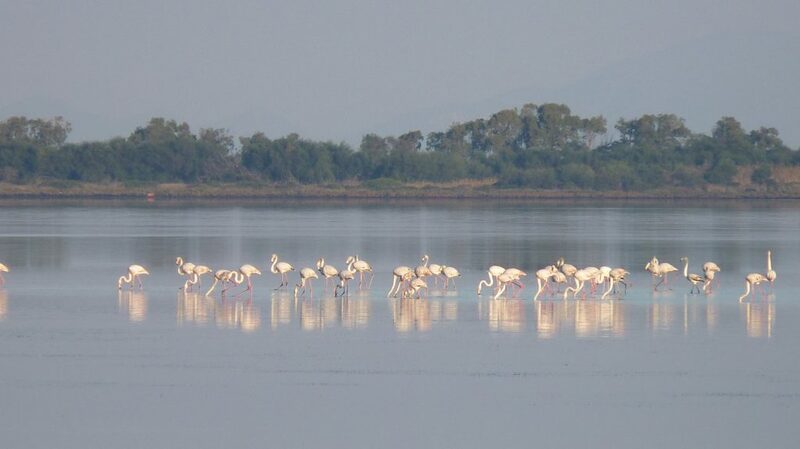 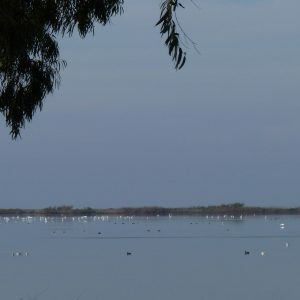 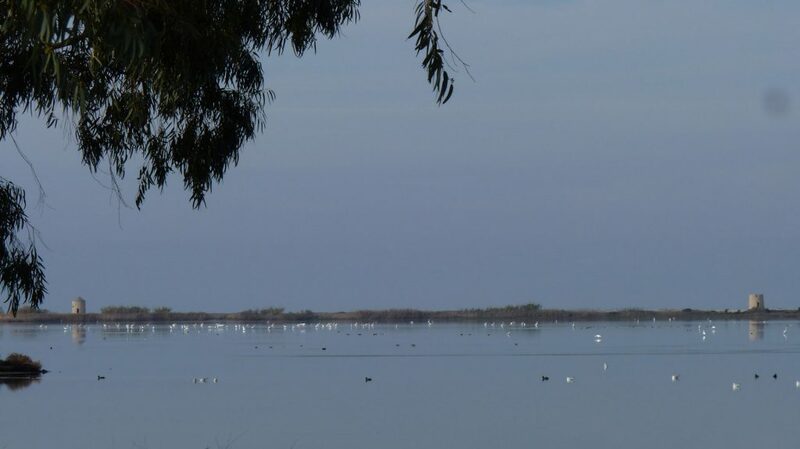 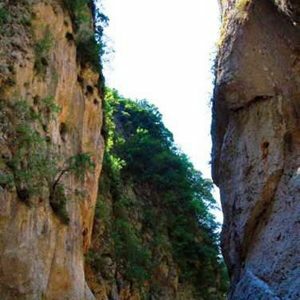 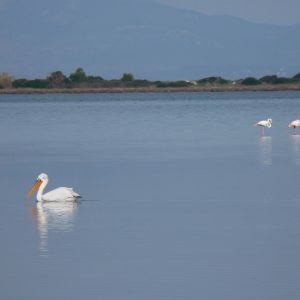 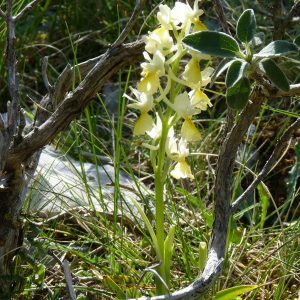 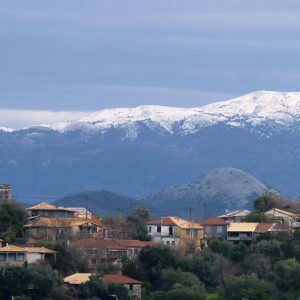 This Western region of Greece has Protected Bird and Wildlife areas for the varied bird populations both visiting and resident. 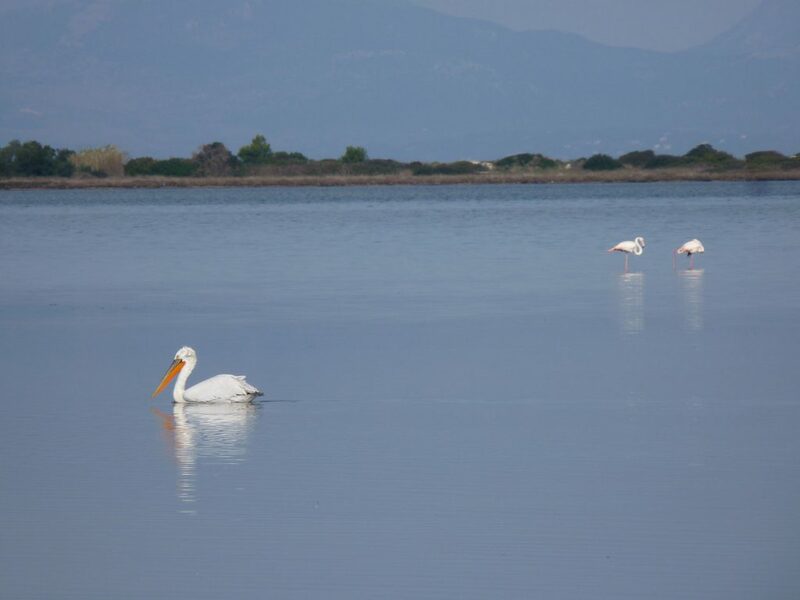 Migrating flamingos and pelicans visit our shores in great numbers annually and in springtime there is a profusion of house martins building their nests and rearing their young. 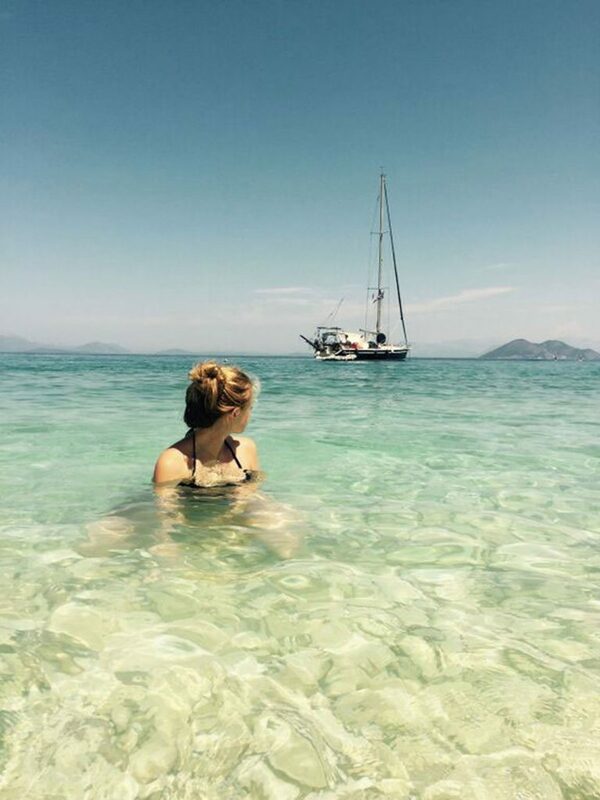 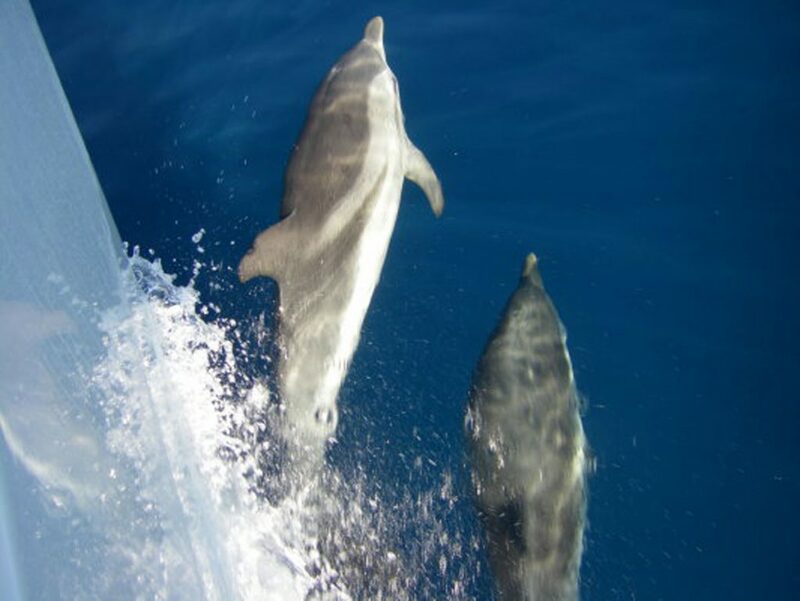 And of course the beautiful Ionian sea holds an abundance of sea life, dolphins, turtles, octopus and a huge variety of fish…you are sure to see some of these on your day aboard a sailing yacht. 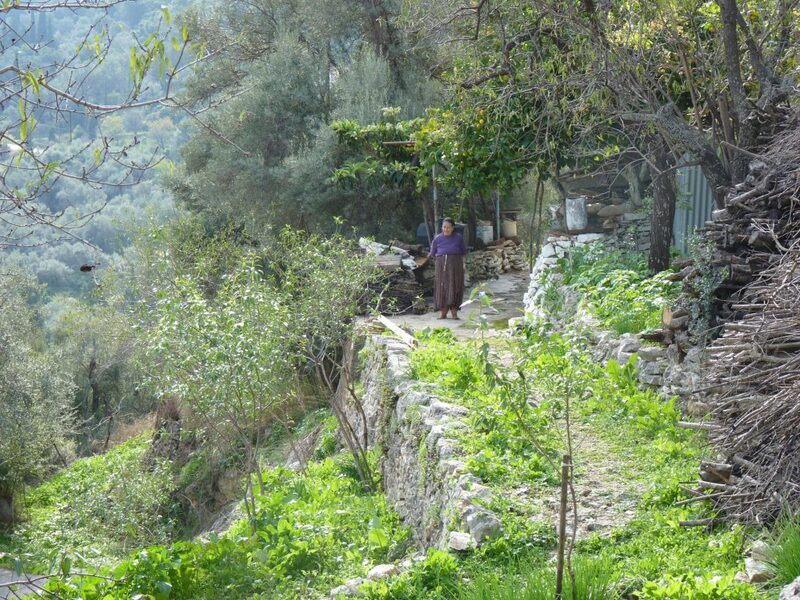 The walks we will follow for the week are taken from Lida Out’s book, Lefkada on Foot (Fagotto editions). 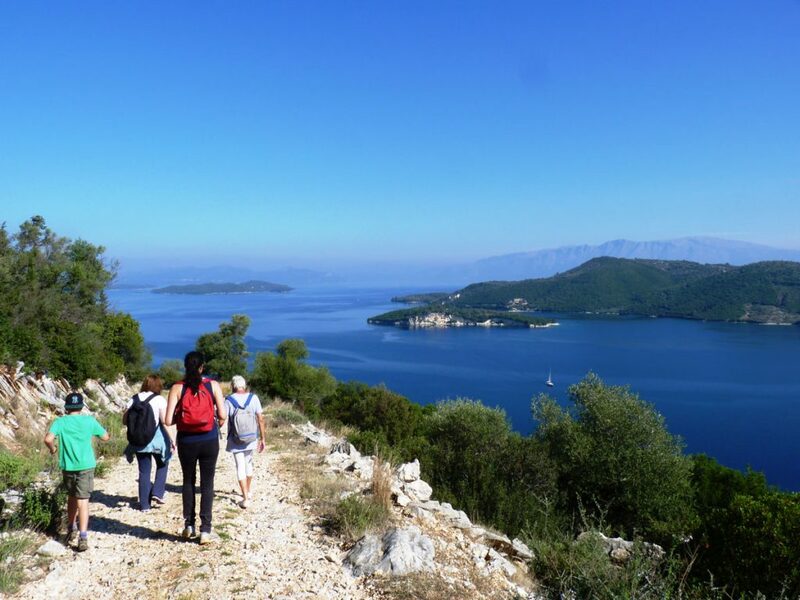 Lida has lived on the island for 25 years and walks weekly on Lefkada with a small group of like-minded friends. 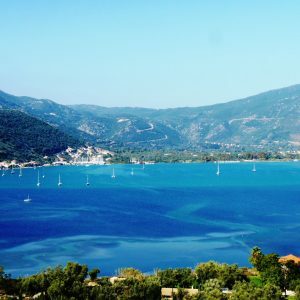 This book was published out of her passion for Lefkada and its natural environment which we will experience first hand this week. 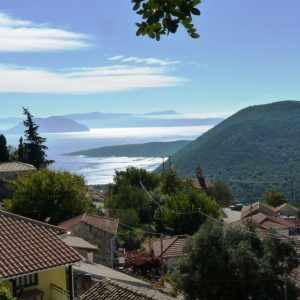 You will be surprised by the variety of landscapes with coastal, inland and village views as well as panoramas across the surrounding Ionian sea onto neighbouring islands and mainland mountains of Greece. 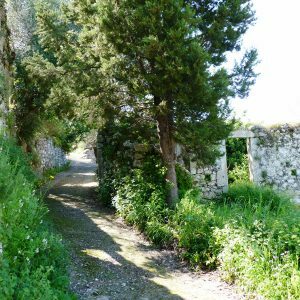 After the walks, you will have free time to relax at the house, enjoy the fireplace or the pool according to the season, or for more exploration on the island… You may as well be interested in a guided visit of the old town with its colorful narrow streets, discovering its architecture and Venetian influences. 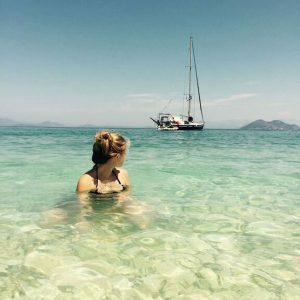 We include a sailing cruise to Meganissi and nearby islets with the quiet bays and turquoise waters that the Ionian is renowned for. 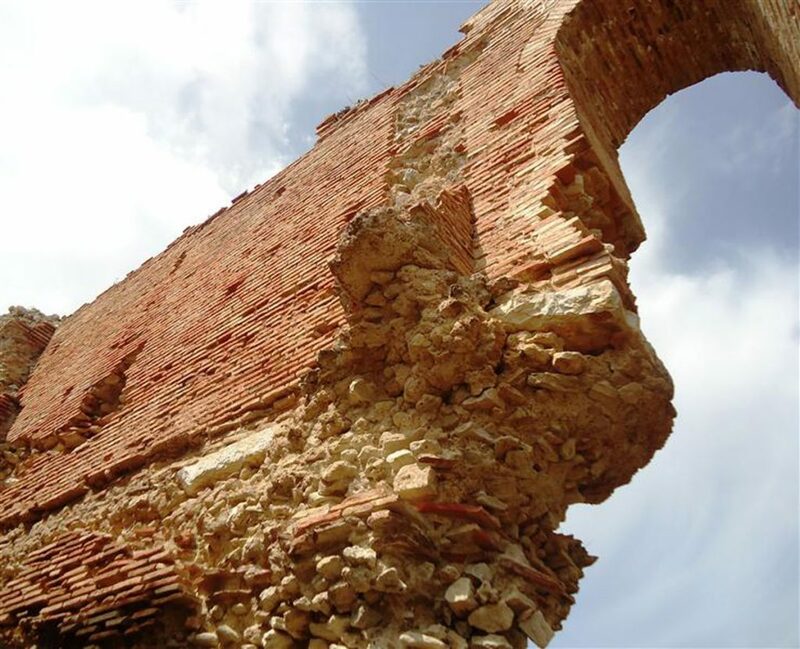 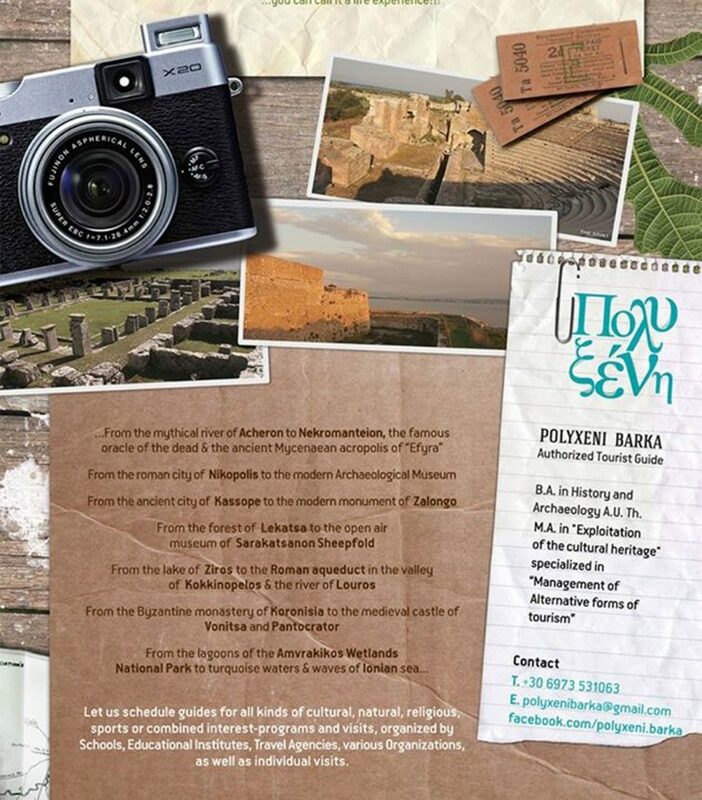 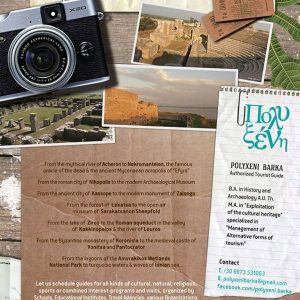 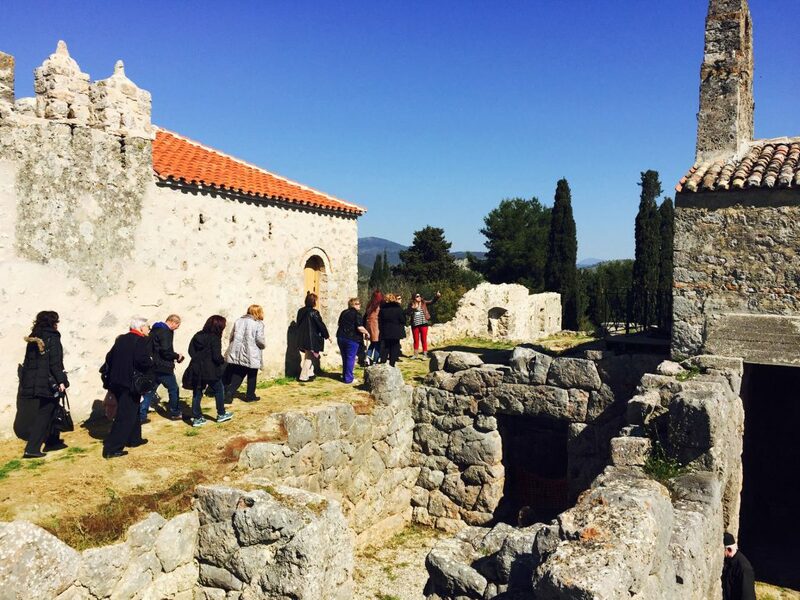 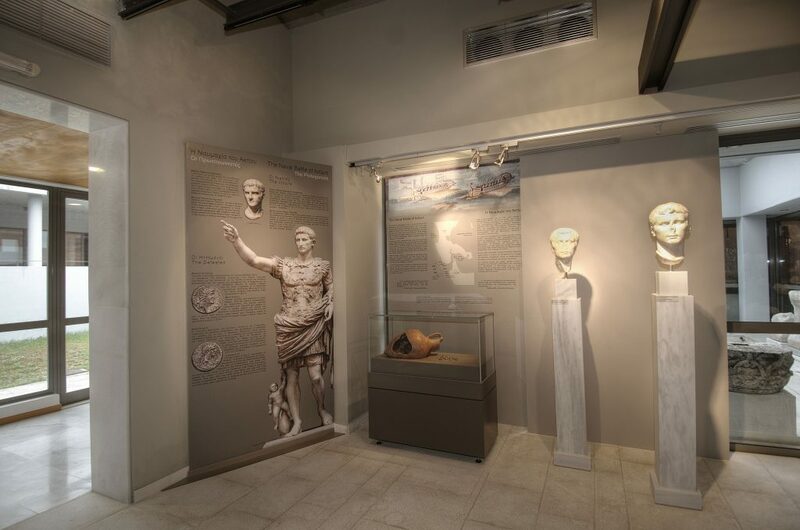 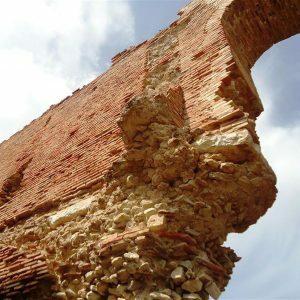 And later in the week the visit to the archeological sites of Nicopolis and Necromandeion in the Preveza area will give you the opportunity to learn about the history of the region, from ancient sites to modern times. 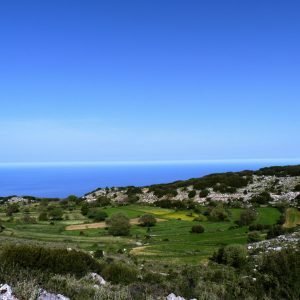 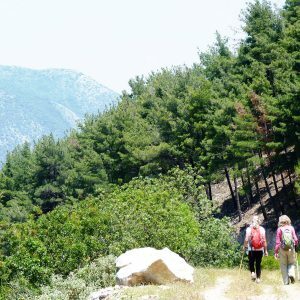 The walking and sightseeing programme includes: your accommodation for 7 nights in a spacious 4 bedroom stone villa with pool, located above the village of Tsoukalades on the West Coast of the island, a welcome hamper, breakfasts, 4 walks (Katouna 6.5km – Athani 14.5km – Kolivata 16km – Fterno 12.5km), a sailing day cruise, a visit to archeological sites in the Preveza area, a dinner at the house, picnic packed lunches for 2 days and snacks, services of your English-speaking experienced local walking leader. 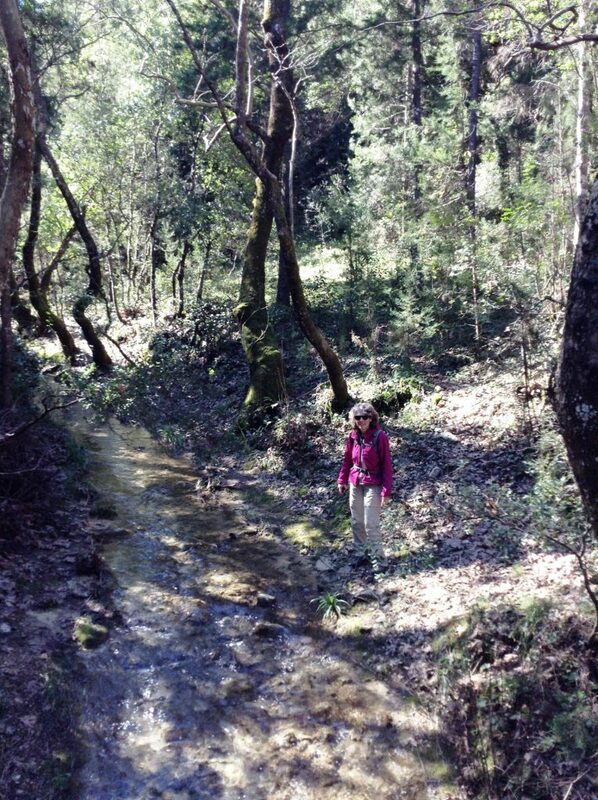 Lesley Lai is your walking leader. 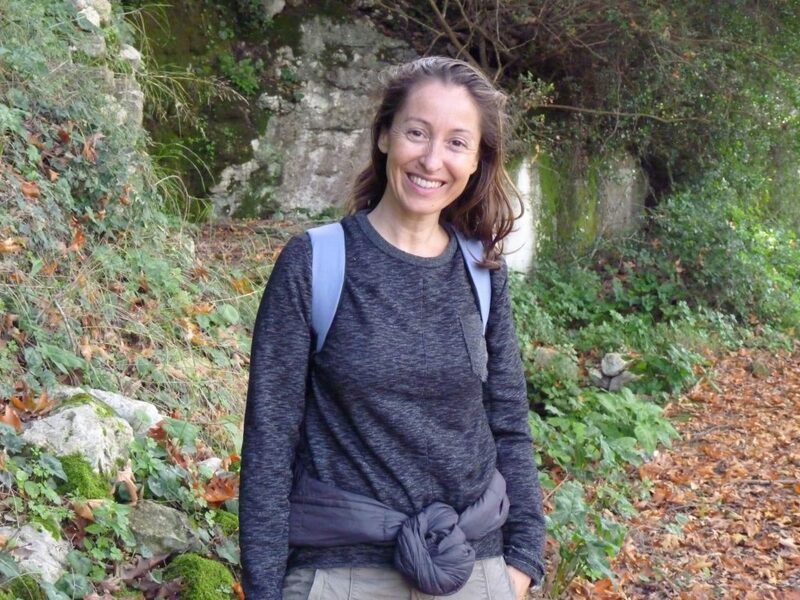 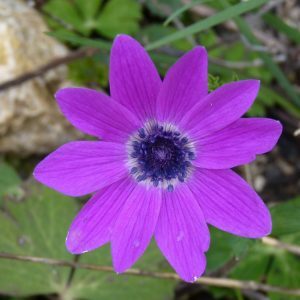 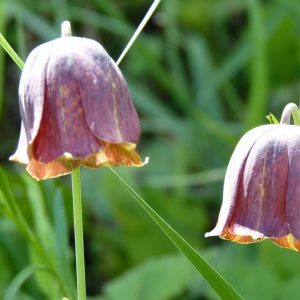 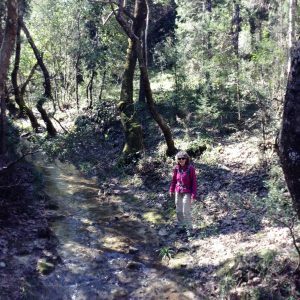 She has been living on Lefkada for 15 years, and is an experienced first aid trained walker, having hiked in the Alps, South America as well as the UK and Greece. 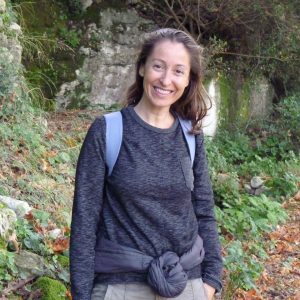 She knows the island very well and enjoys sharing her wealth of knowledge about the flora, fauna, history and customs of the island. 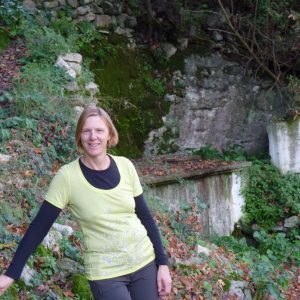 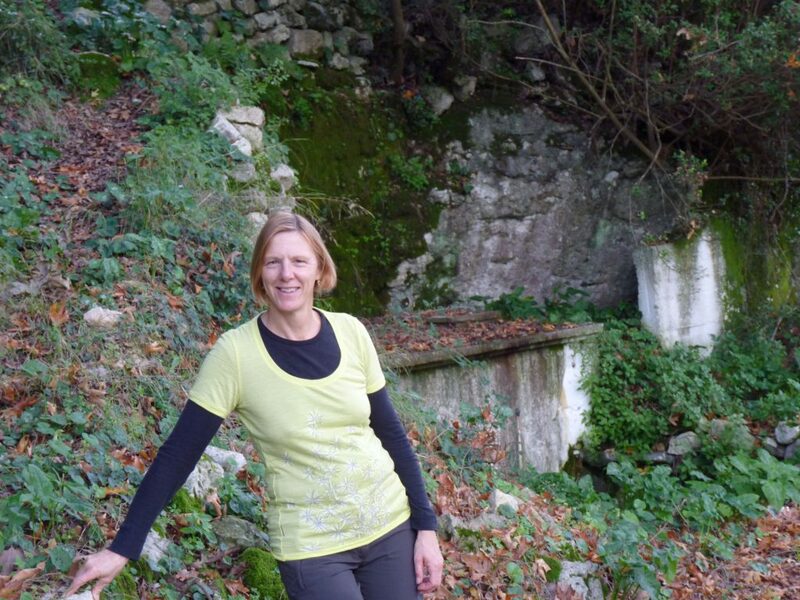 Julie Neveu Fouros is the owner and manager of your accommodation. 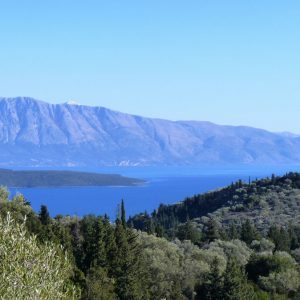 She’s been living in Lefkada for 17 years with her family, walking every week with the same enthusiasm for the nature and culture of the island. 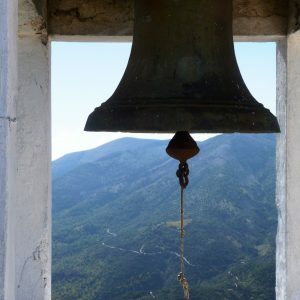 She will be there to assist you with any matter during the week. 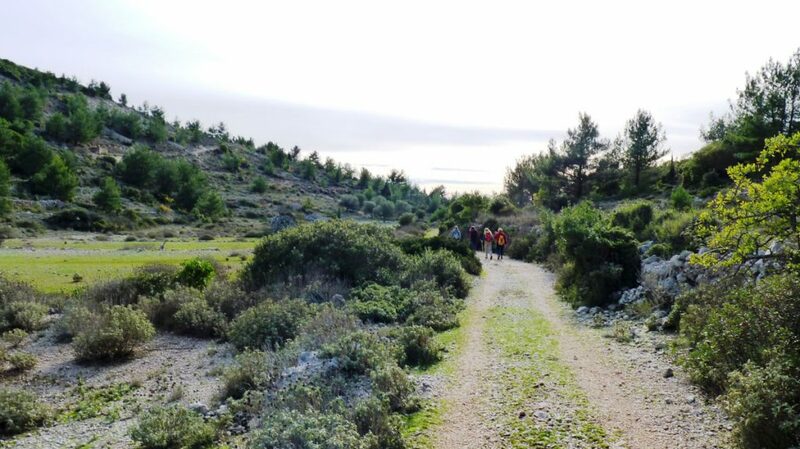 Prices start from 450€ per person for an 8 person group. 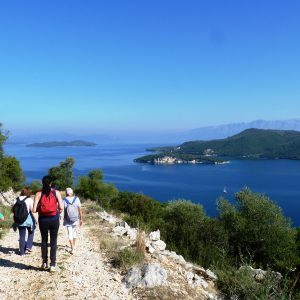 We also can tailor your holiday to your interests and preferences, i.e the level of walking, extra sightseeing, etc… The programme is available all year round, except July and August. Meeting with the owner and your walking leader. 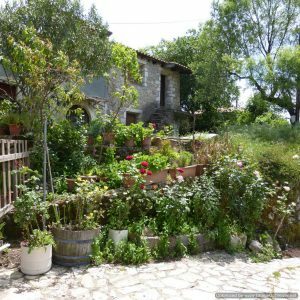 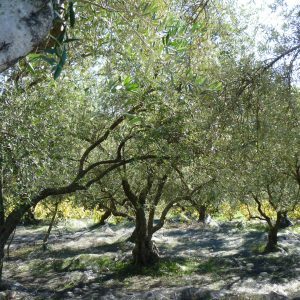 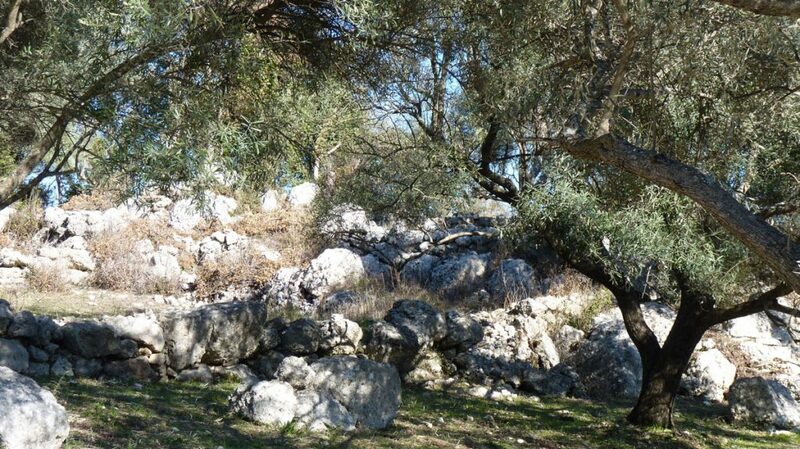 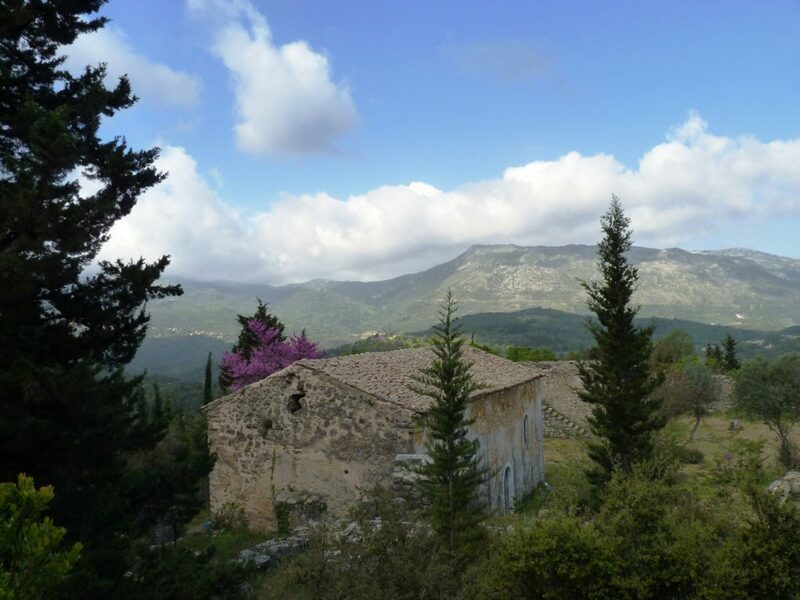 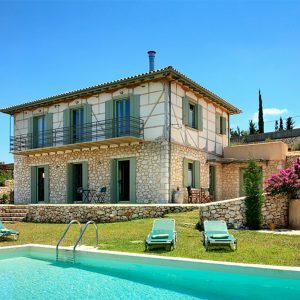 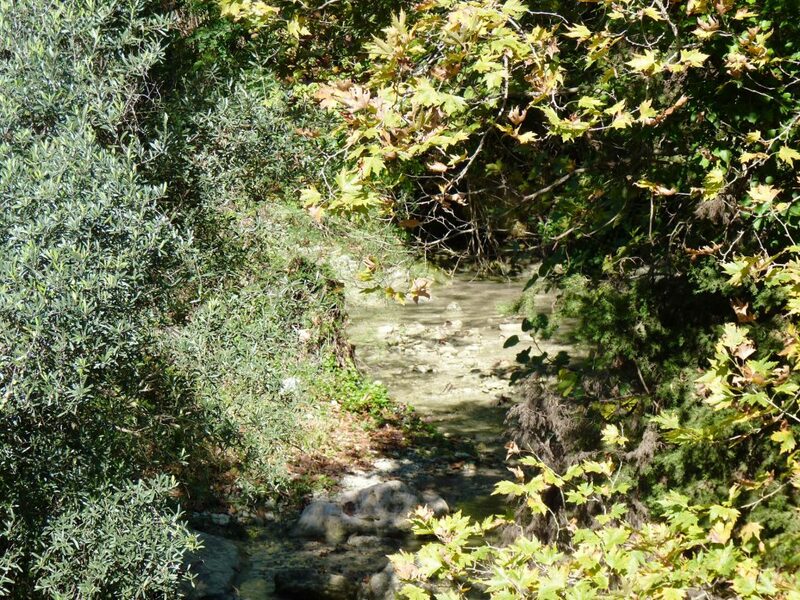 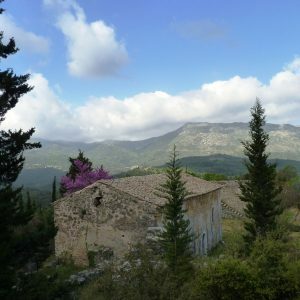 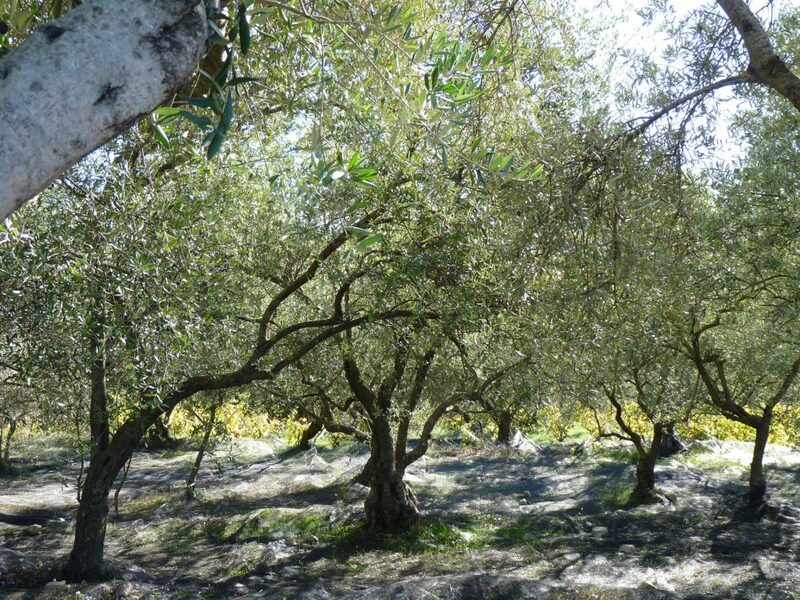 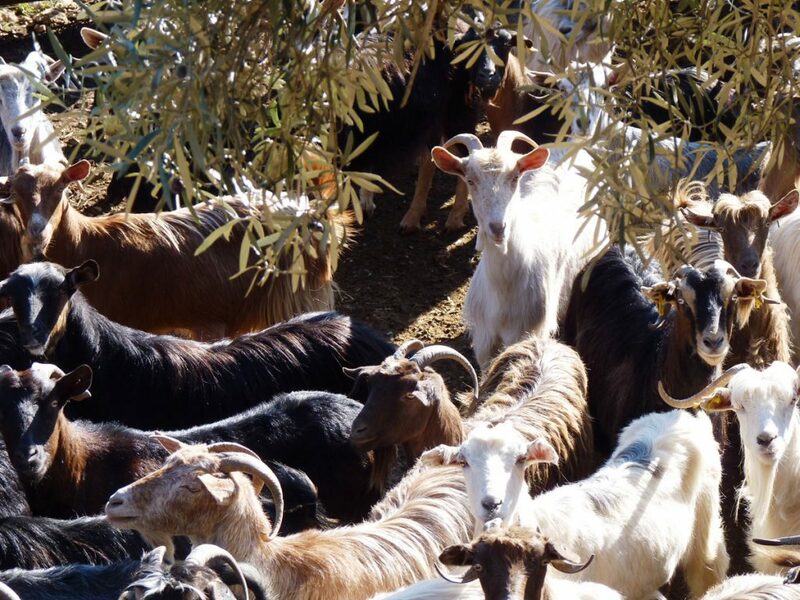 Depending on your time of arrival, we will do a small walk in the nearby lanes and olive groves around the house. 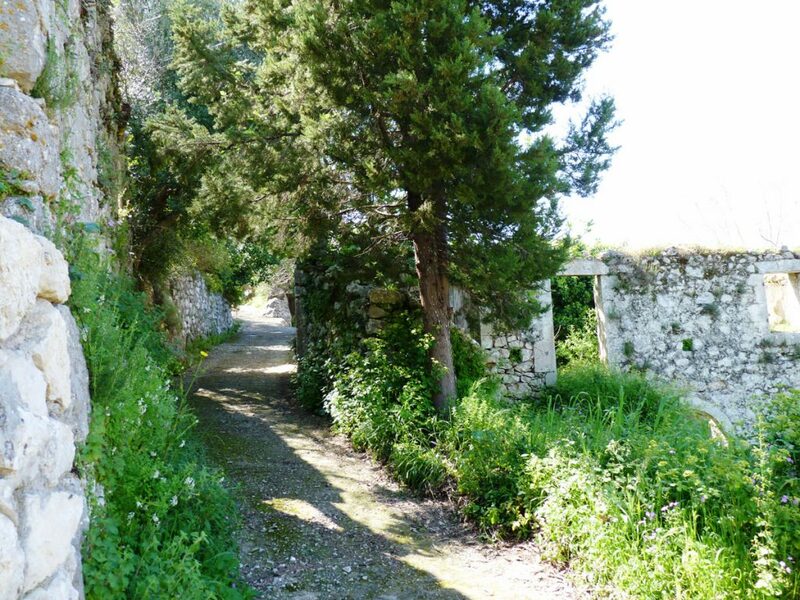 You’ll have some time to relax or take a stroll around the village. 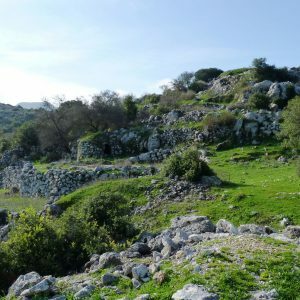 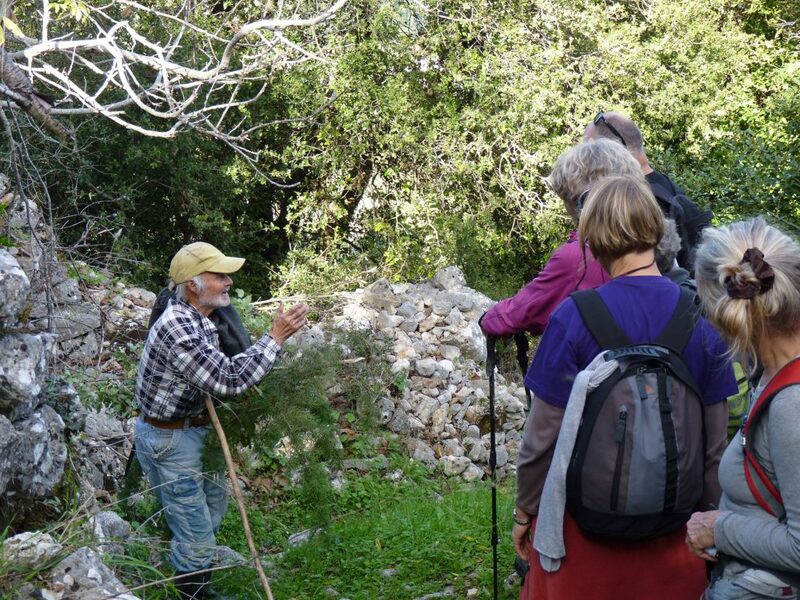 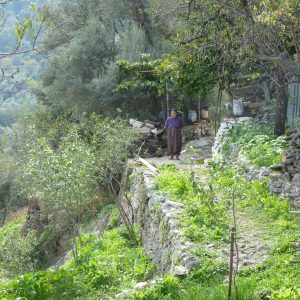 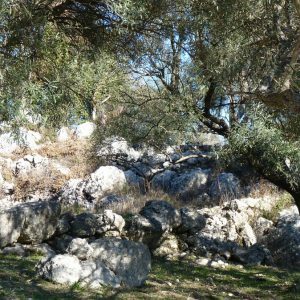 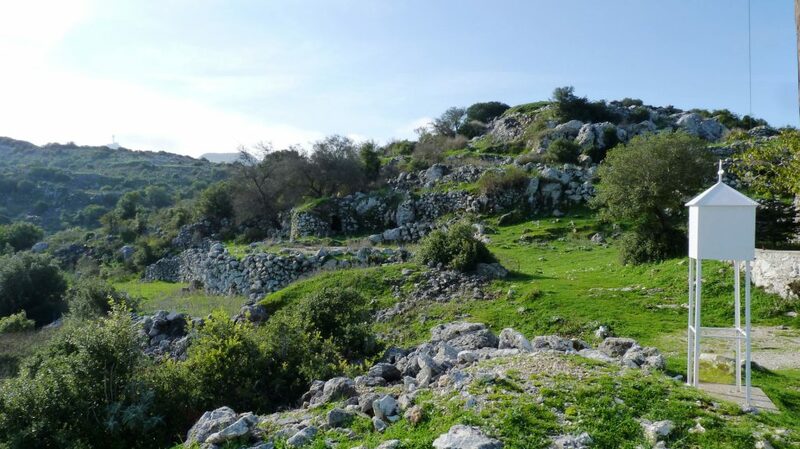 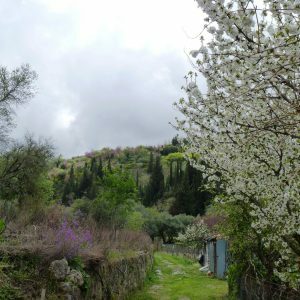 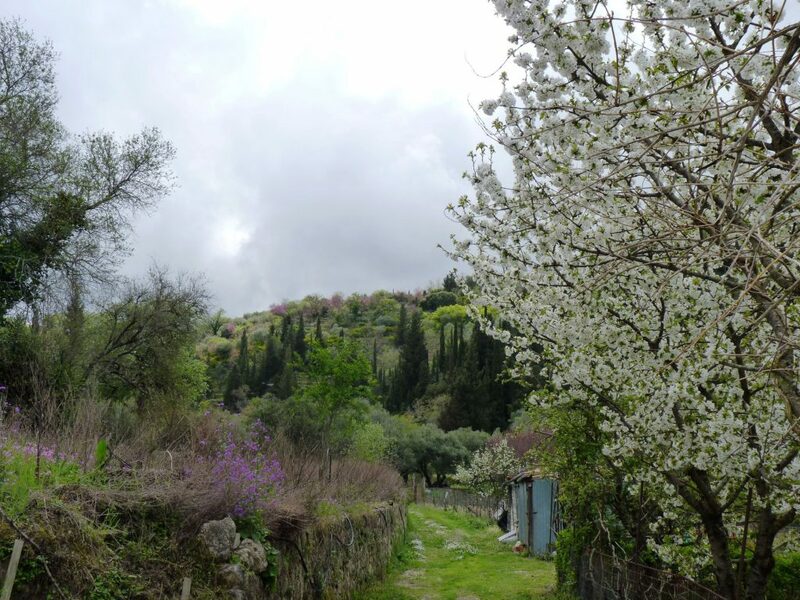 This walk starts in the centre of the village and ascends down and around the hill, which the village sits on, past olive groves and make our way back up into and through Katouna. 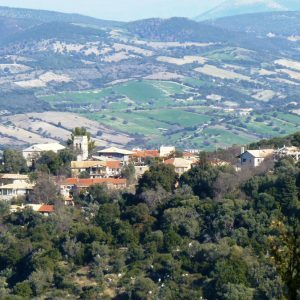 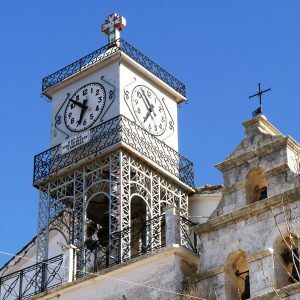 We start in the village square of Katouna and walk through the village and out onto the south east side to take in views of the coastal villages, the inland sea and mainland mountains. 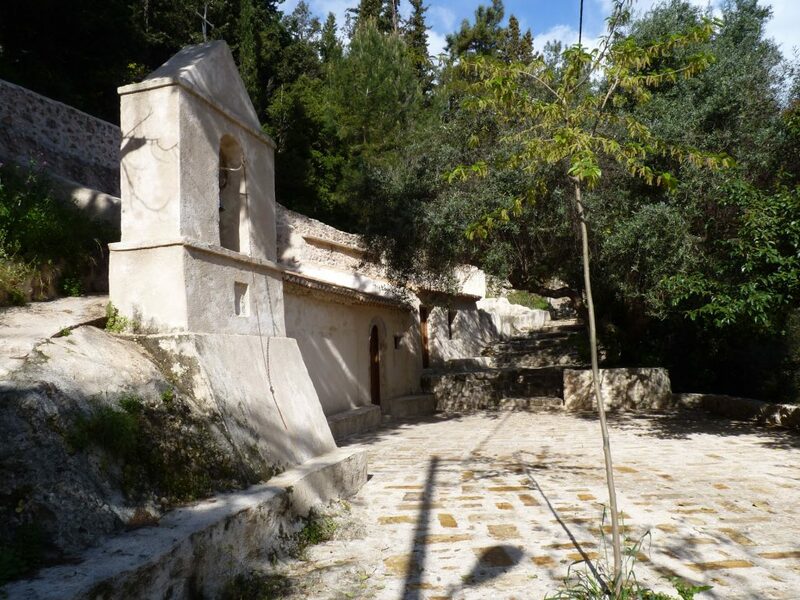 We descend down tracks surrounded by olive groves and after nearly an hour we begin our climb back up in to the village on the north side, passing the church of Agia Varvara (Saint Barbara) and wind our way through the attractive narrow lanes of the village returning to the square. 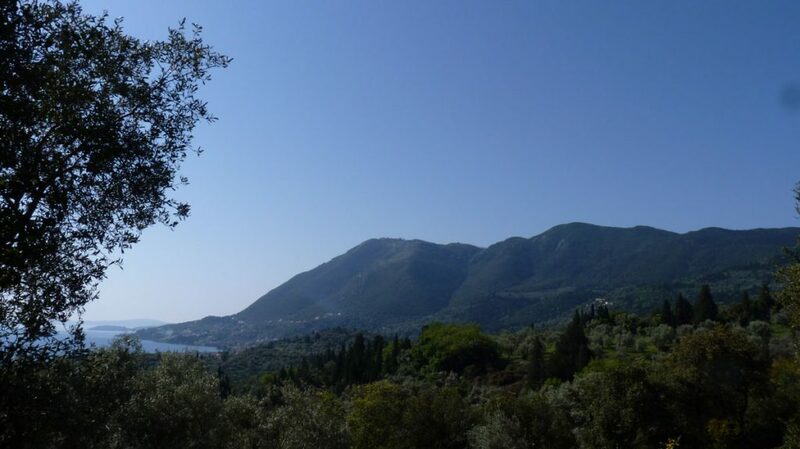 Lunch will be taken in a taverna today either in Katouna or Ligia. 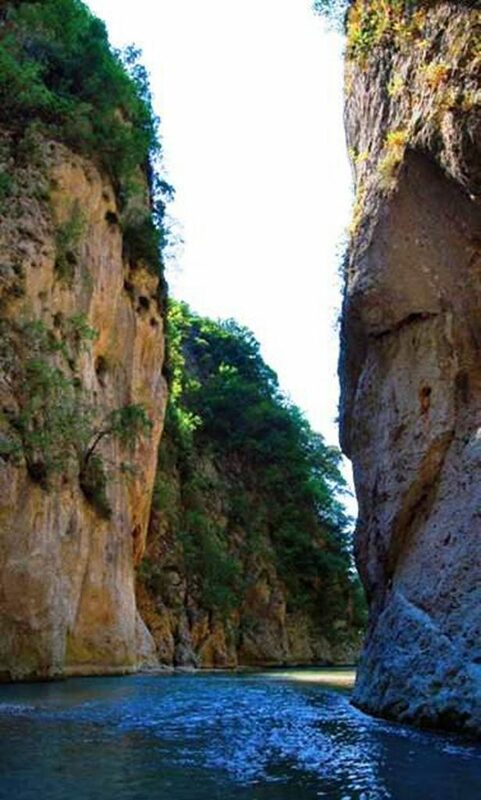 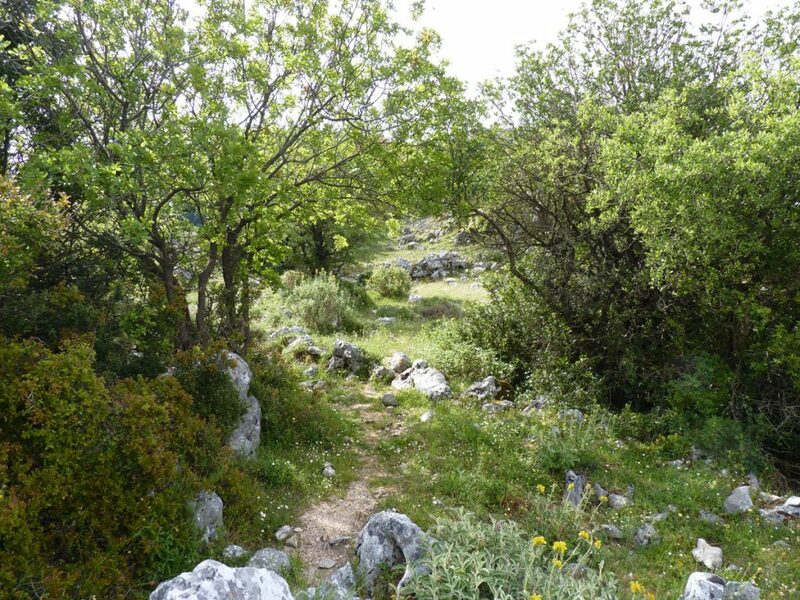 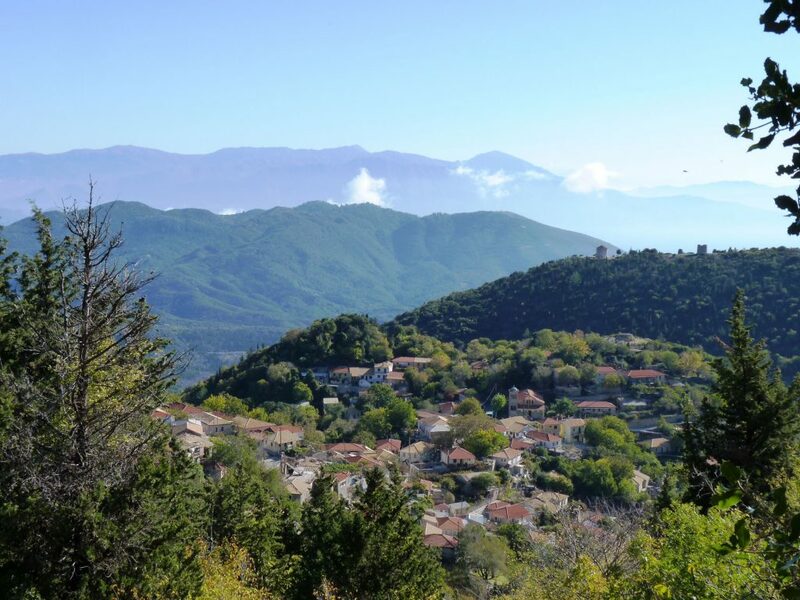 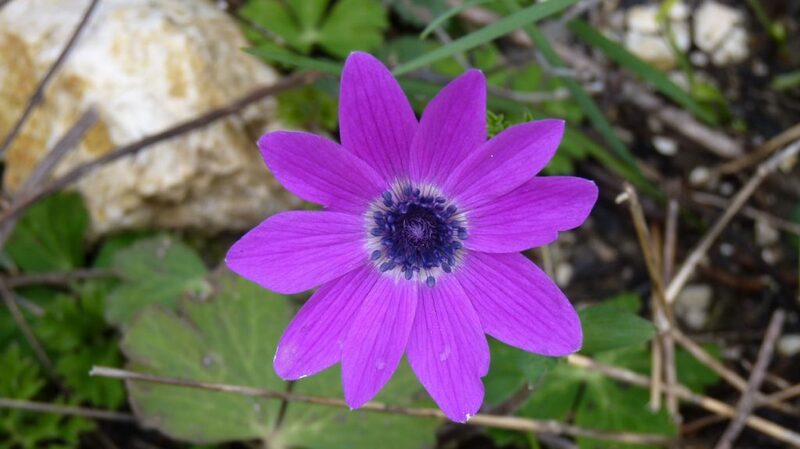 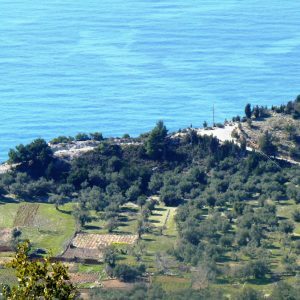 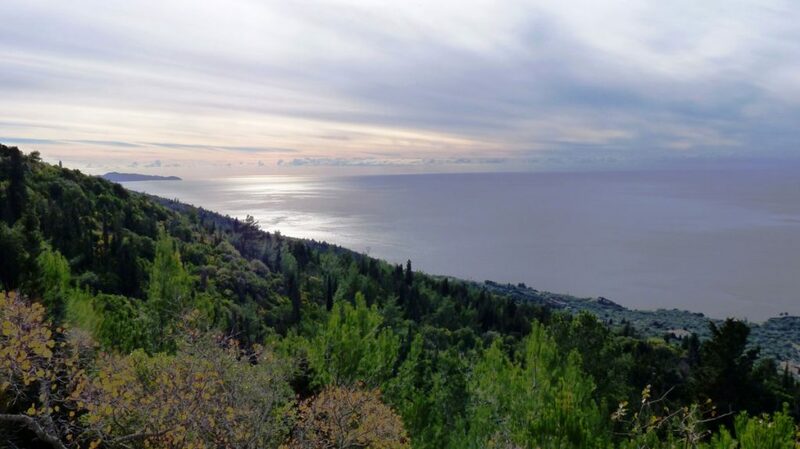 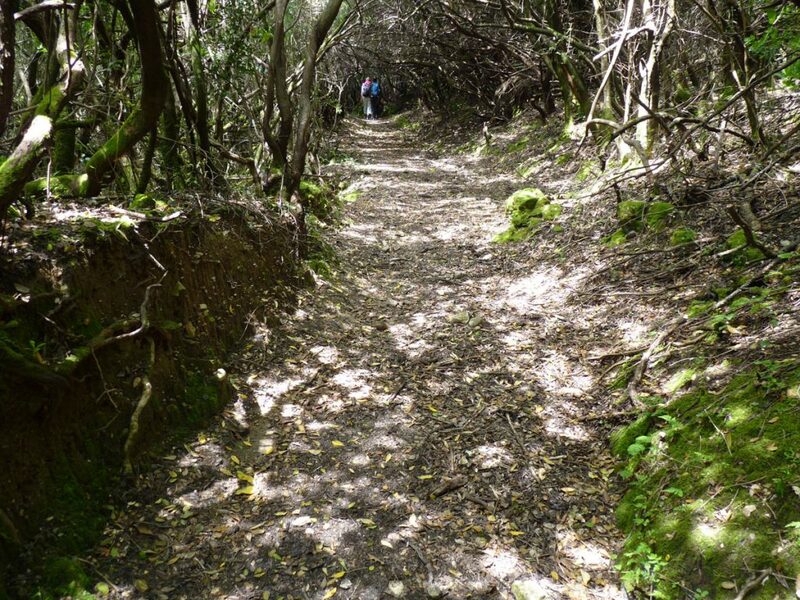 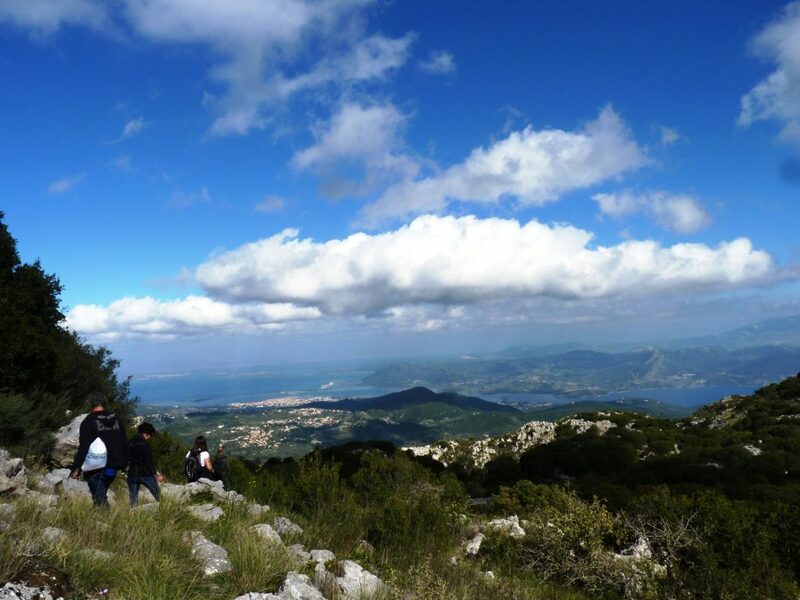 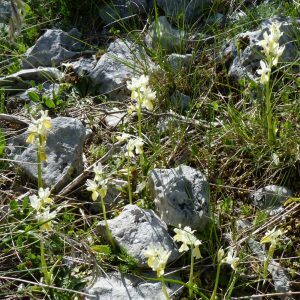 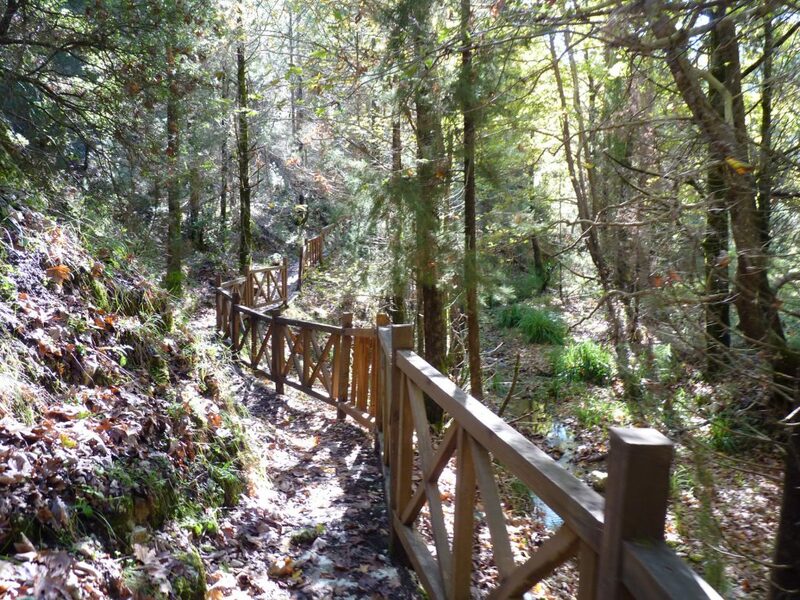 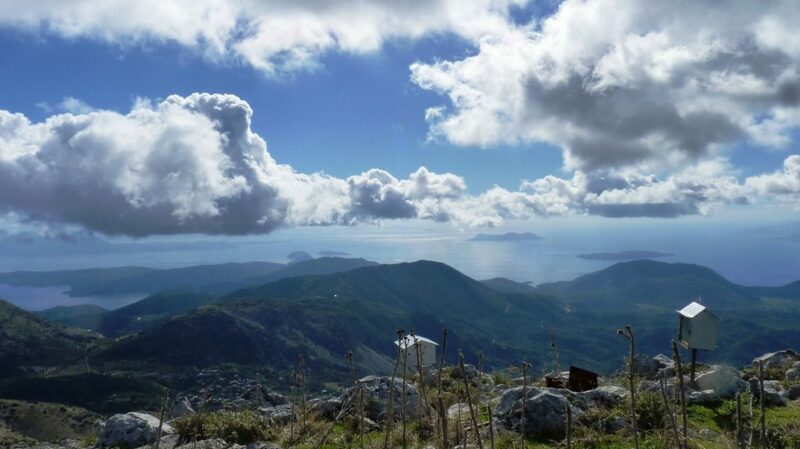 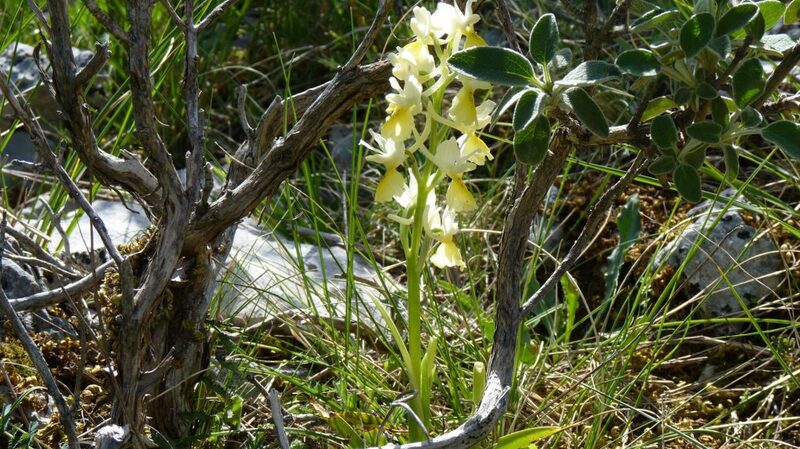 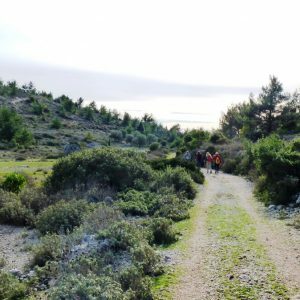 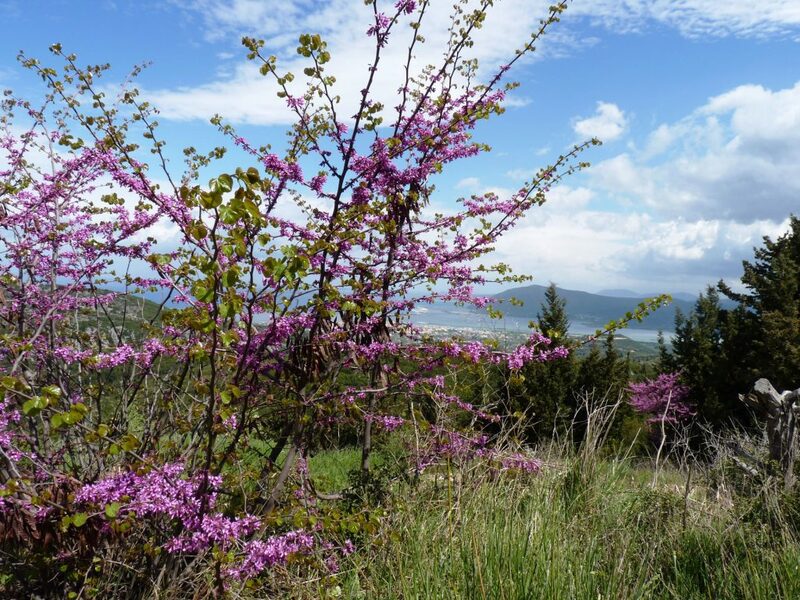 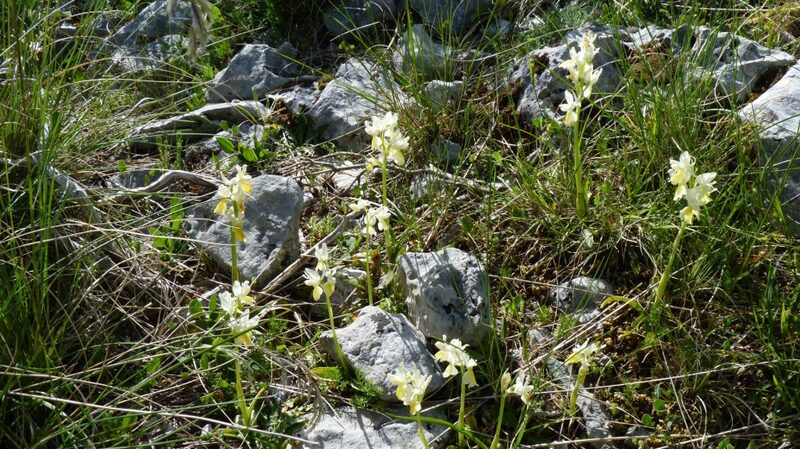 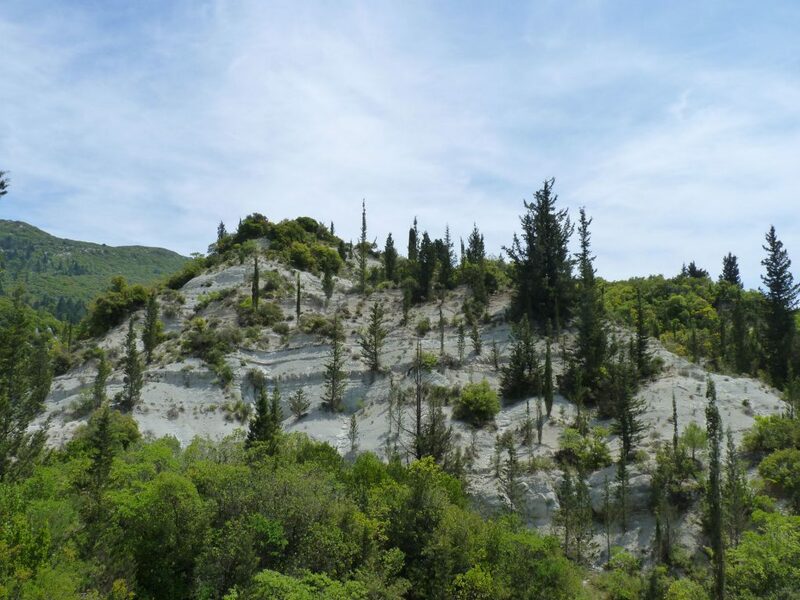 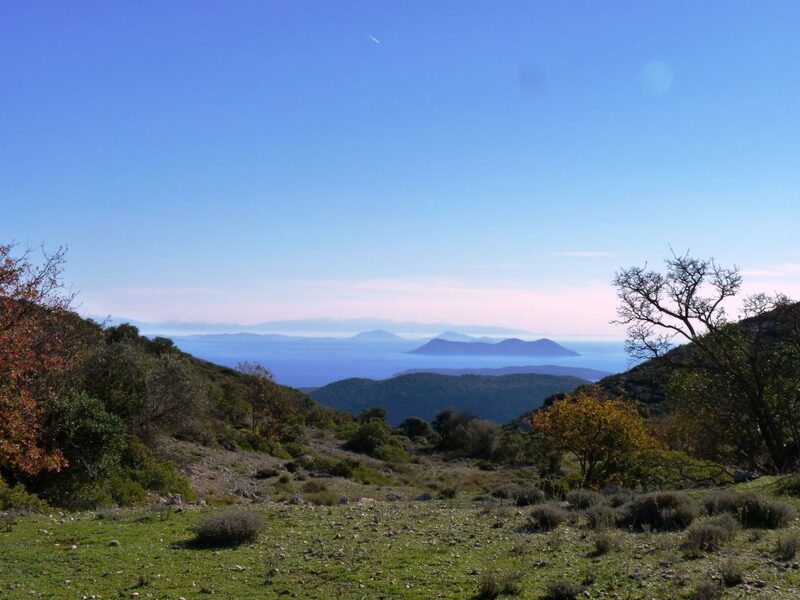 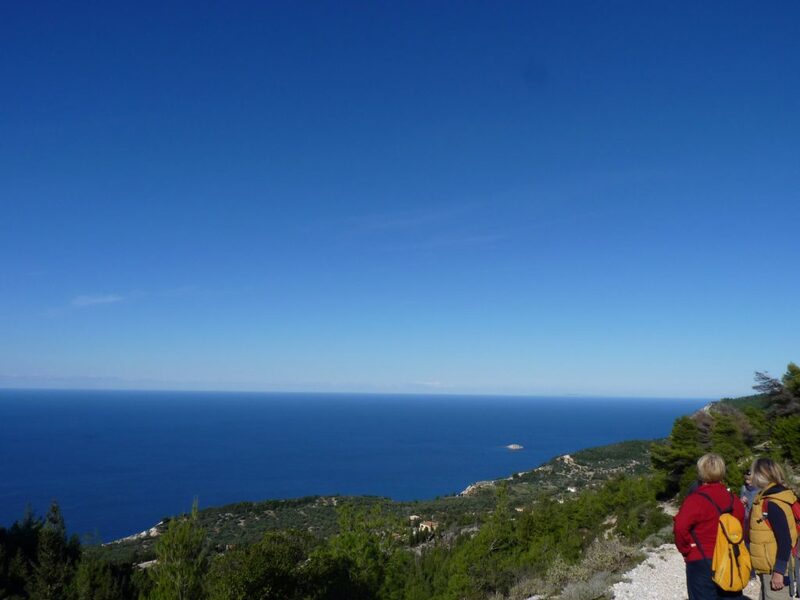 This walk is set in the south west of Lefkada island high above the Ionian sea. 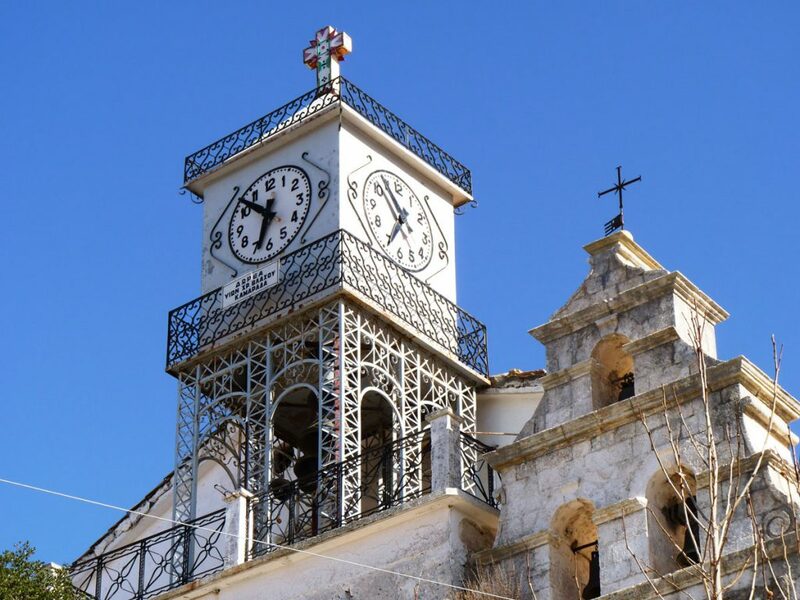 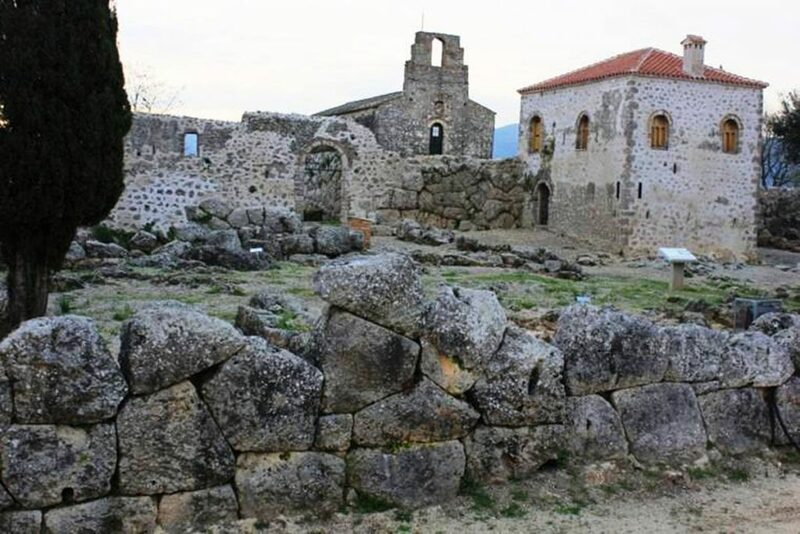 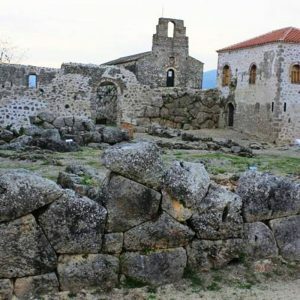 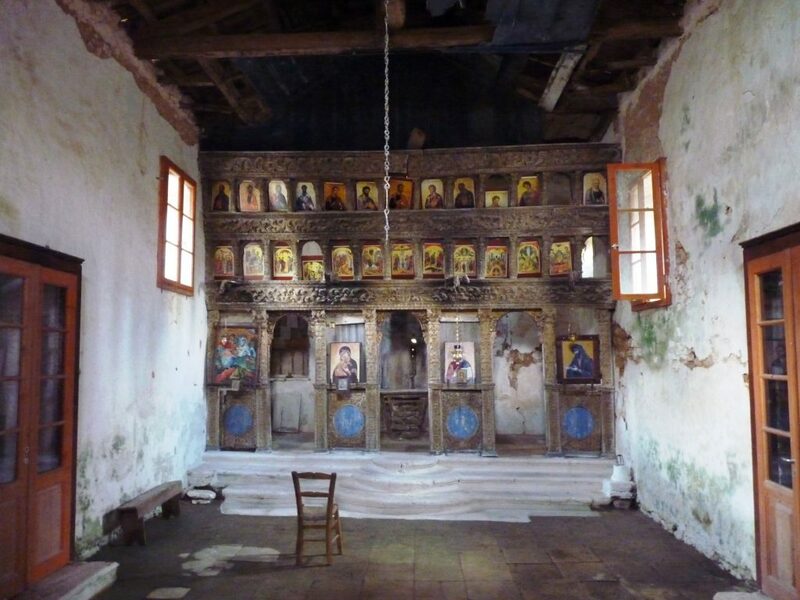 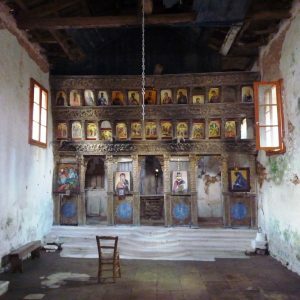 It begins at the church in the village of Athani which is a traditional village that is passed through by most visitors to the island to visit the stunning west coast beaches of Porto Katsiki and Egremni. 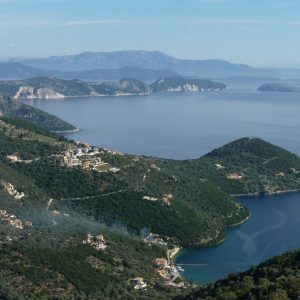 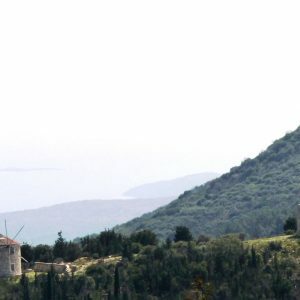 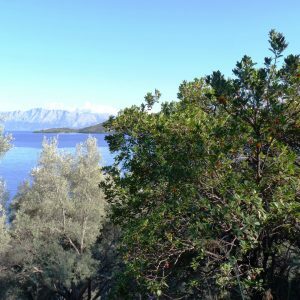 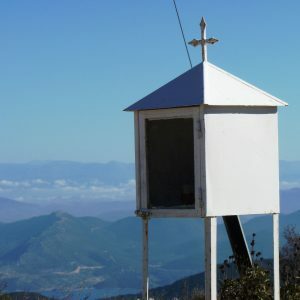 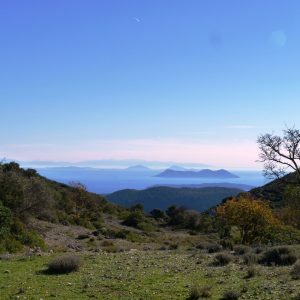 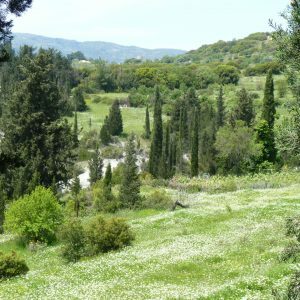 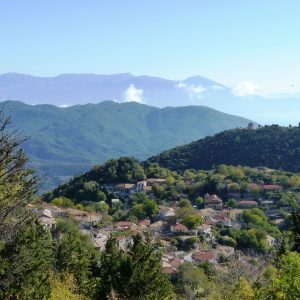 From the church we ascend up a farm track through pine trees and climb above the tree line taking in views of the neighbouring islands of Cephalonia and Ithaka. 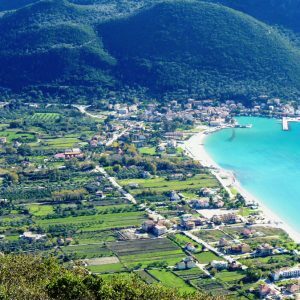 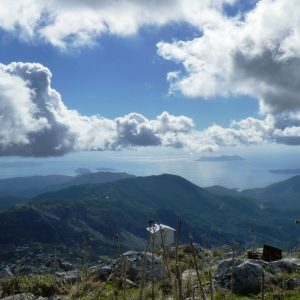 As we round the Mega mountain, which we are circling on this walk, we have a bird’s eye view of the south coast village and bay of Vassiliki, Mount Elati is opposite dotted with small mountain villages. 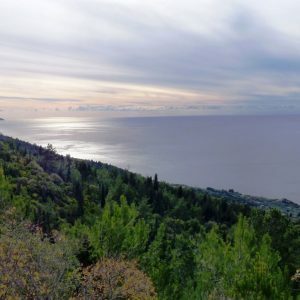 We walk for about 20 minutes on the road and then turn onto tracks again continuing around the mountain now facing west to the open Ionian sea. 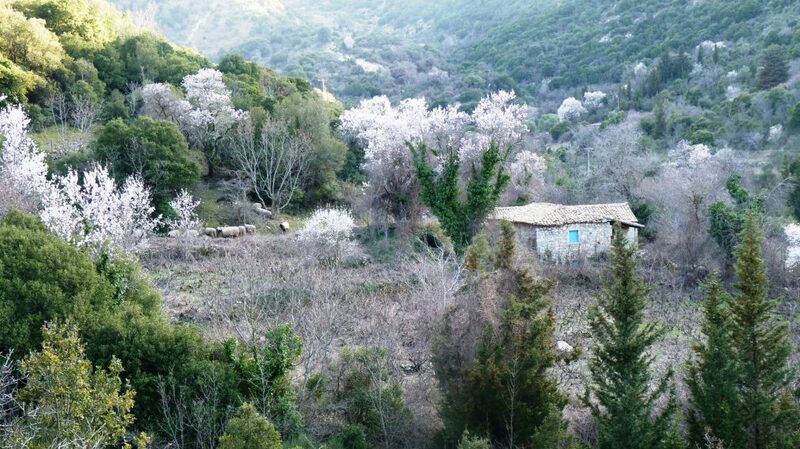 We descend through the pine trees and return to the village. 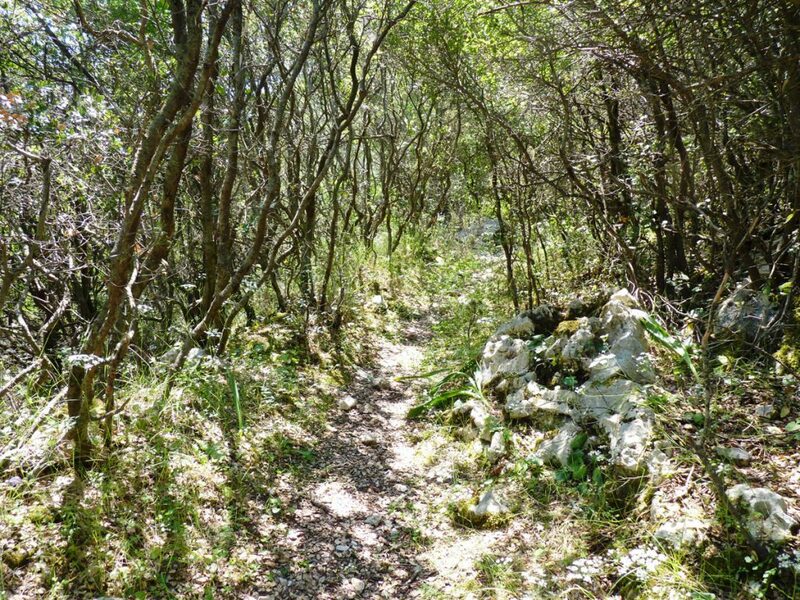 Lunch will be a picnic packed lunch. 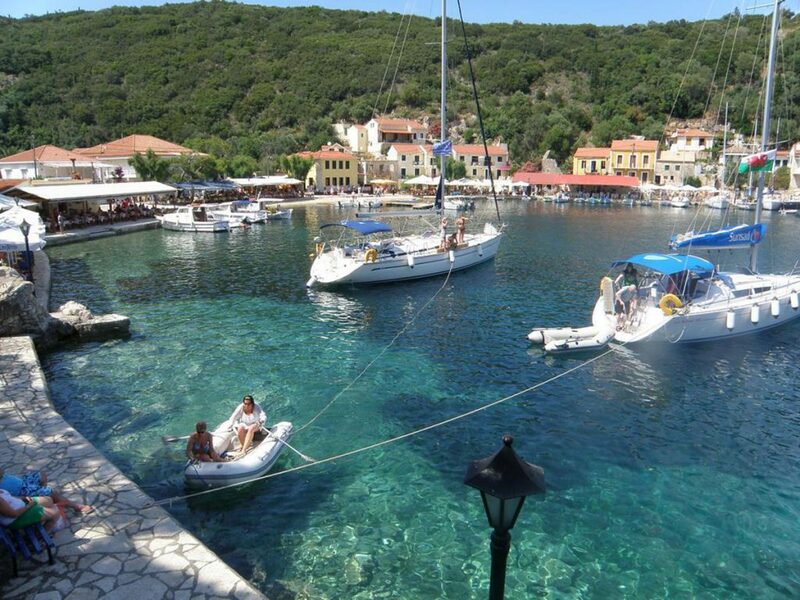 Today you will make your way down to a local island harbour to join your boat and captain. 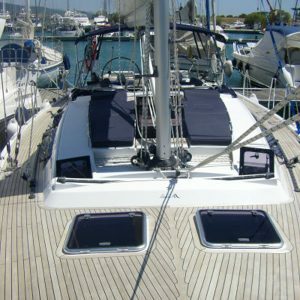 The captain will show you around the boat, give you a safety briefing and the day’s itinerary, then set sail. 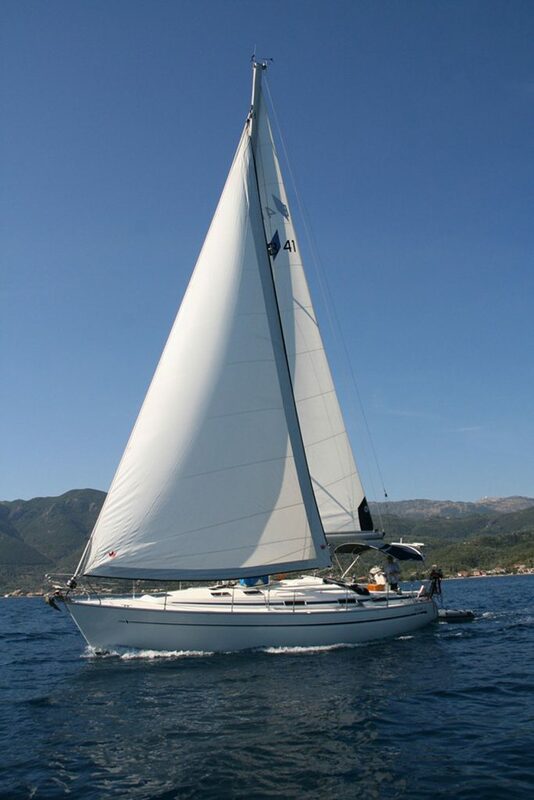 Depending on the weather you will either sail or motor to a quiet bay where you will anchor and be able to test the water and take a swim. 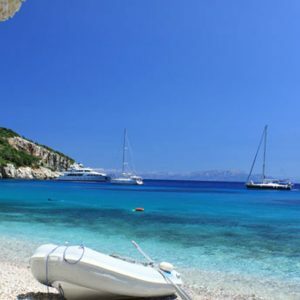 After the captain will take up the anchor and take you to a local fishing village where you will step ashore and take lunch in a local taverna. 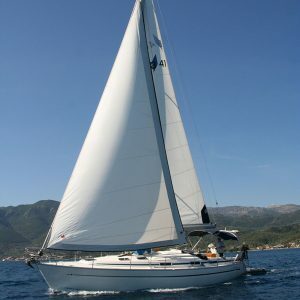 Later you will leave the village and take a sail in the afternoon breeze. 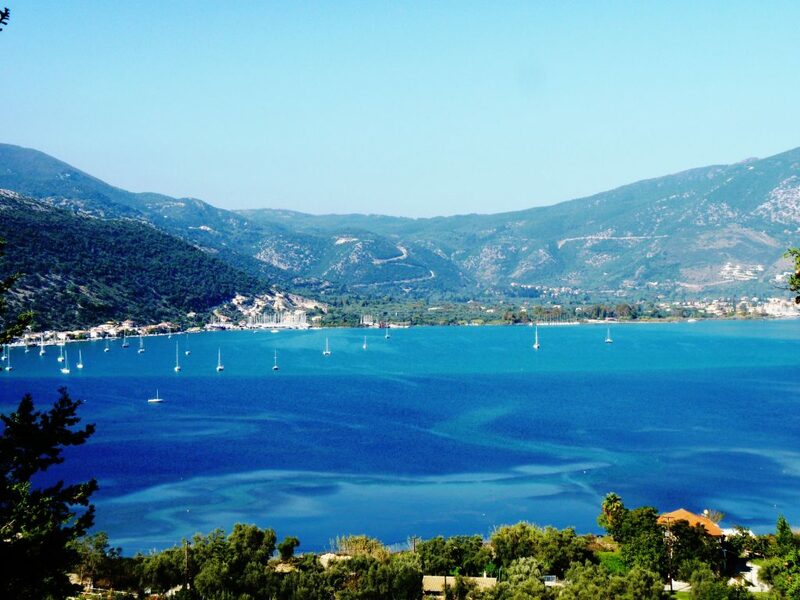 You will return to the port on Lefkada, and before leaving enjoy a glass of wine or beer with the captain and chat about your day on the water. 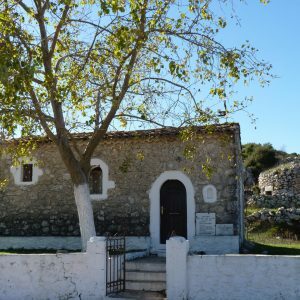 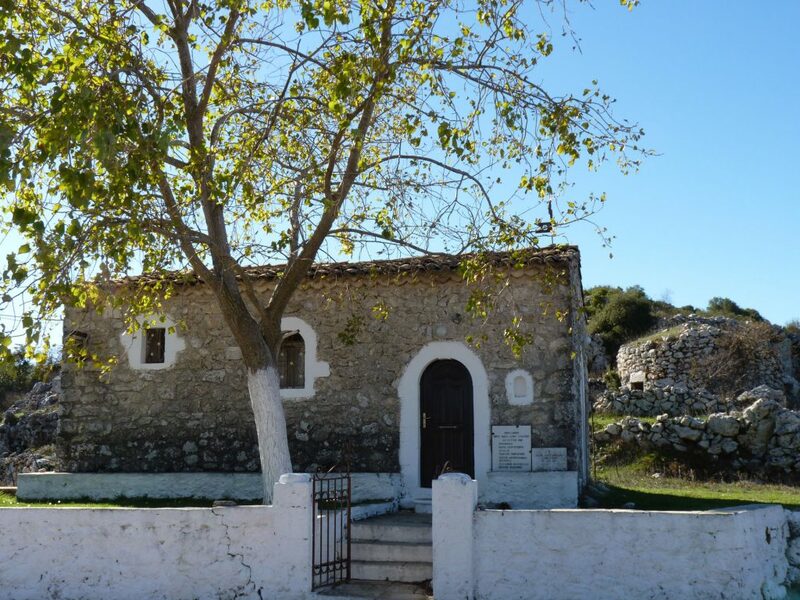 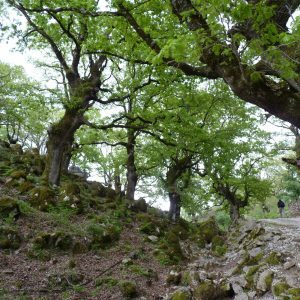 This walk begins in the village of Kolivata and we will pass by an old church, a monastery, a unique oak wood and follow one of the oldest monopati (footpaths) on the island. 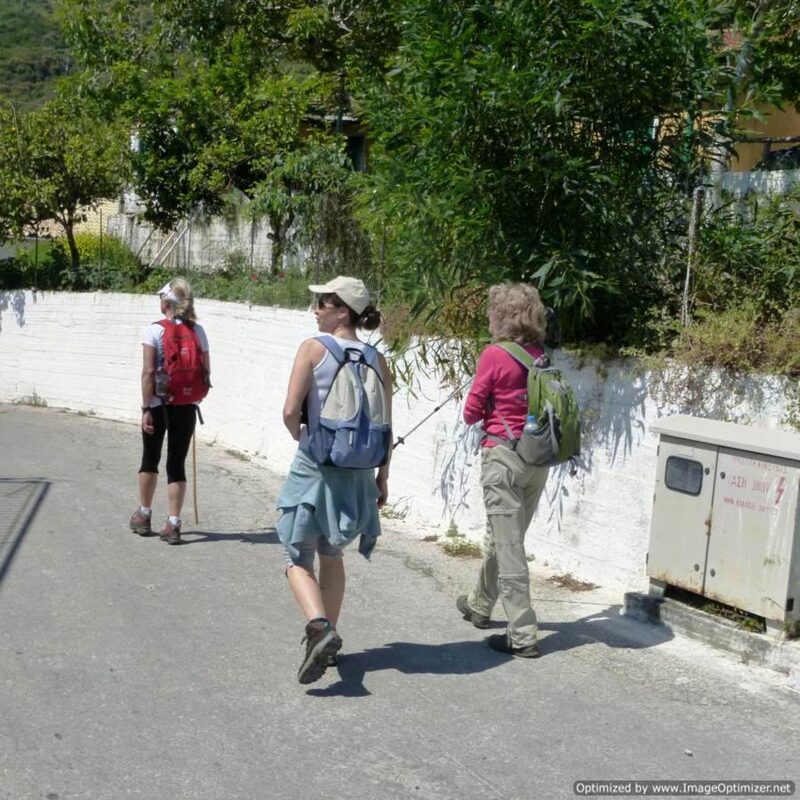 We will start the walk in front of Maria’s taverna where we will have lunch later at the end of the walk. 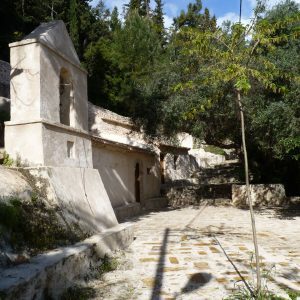 We ascend behind the taverna and make our way up to the monastery of Agios Georgios. 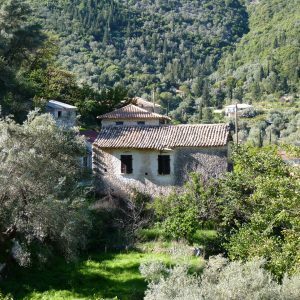 From here we will follow the old monopati up Skaros mountain which then opens onto a terraced area and gives views on to the plain of Karya. 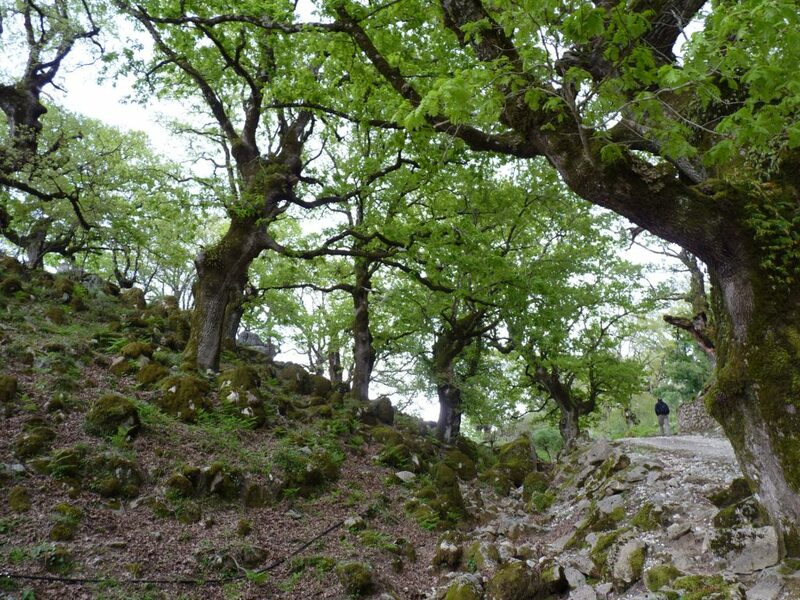 After descending we will pass through a wooded area full of oak trees, quite unique to this region. 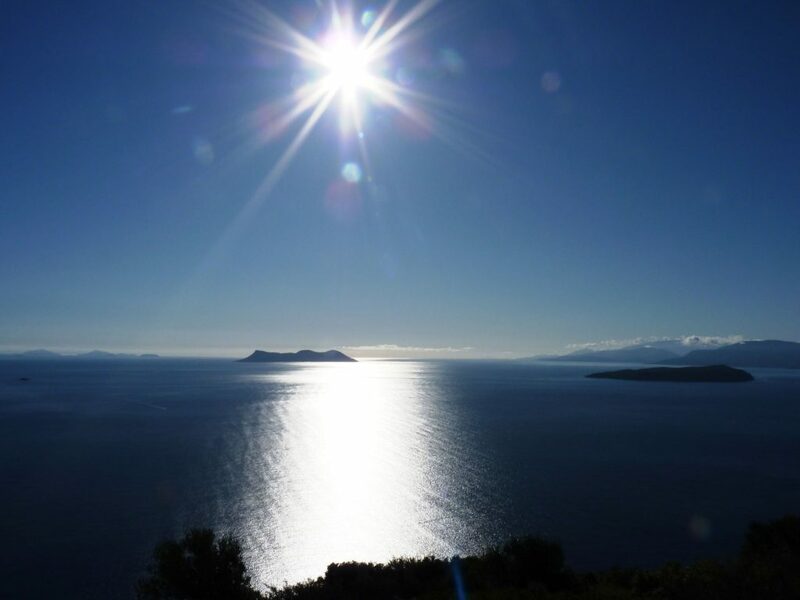 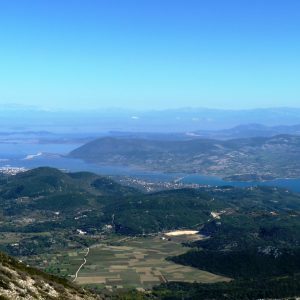 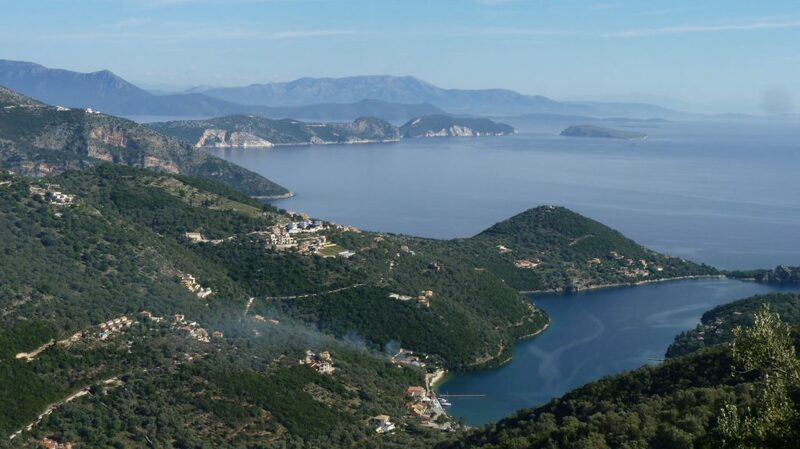 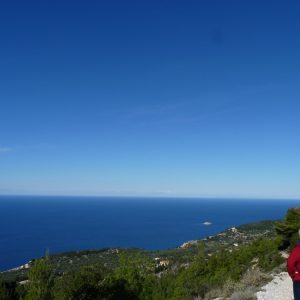 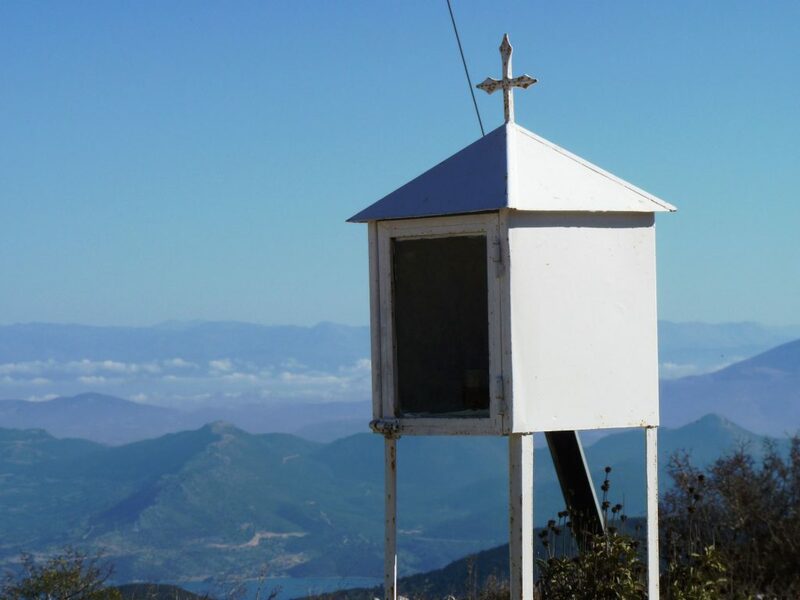 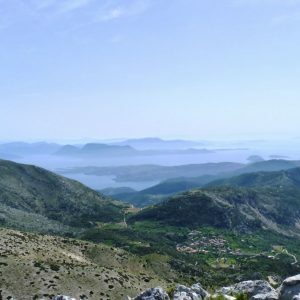 We will visit a viewpoint that offers panoramic views of the east coast of Lefkada, its satellite islands of Skorpios, Meganissi and Kalamos as well as the mountains of western Greece. 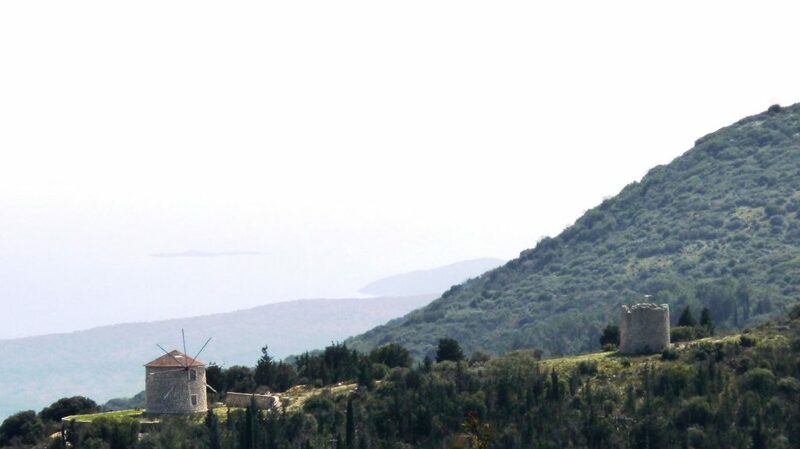 From this point we will descend for about an hour towards the Red monastery. 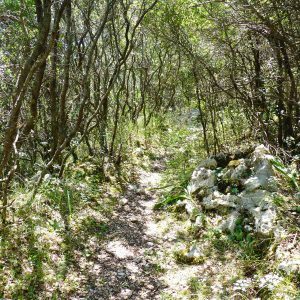 After a short rest here we will walk through an old wooded area, quite a different environment from any that we will experience this week. 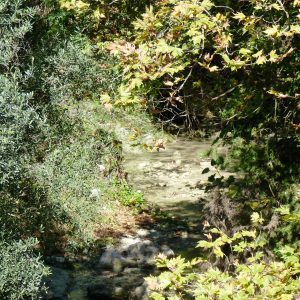 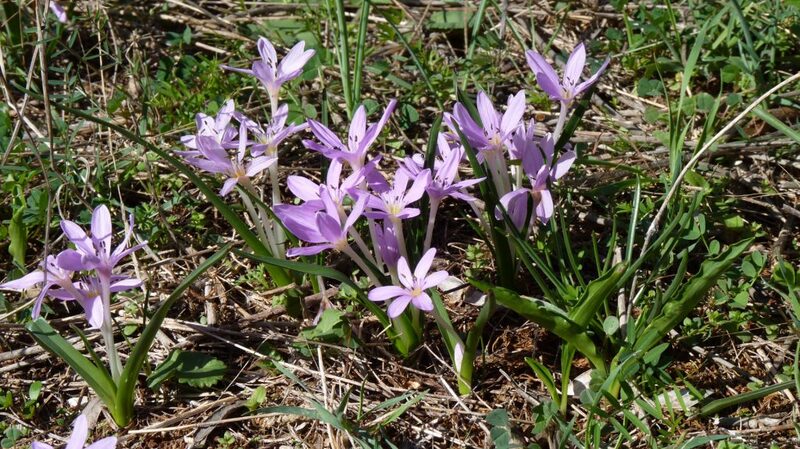 We will continue to follow tracks, cross a river bed, pass an old spring that was used by villagers in years gone by and finally make our way up in to the village square of Kolivata. 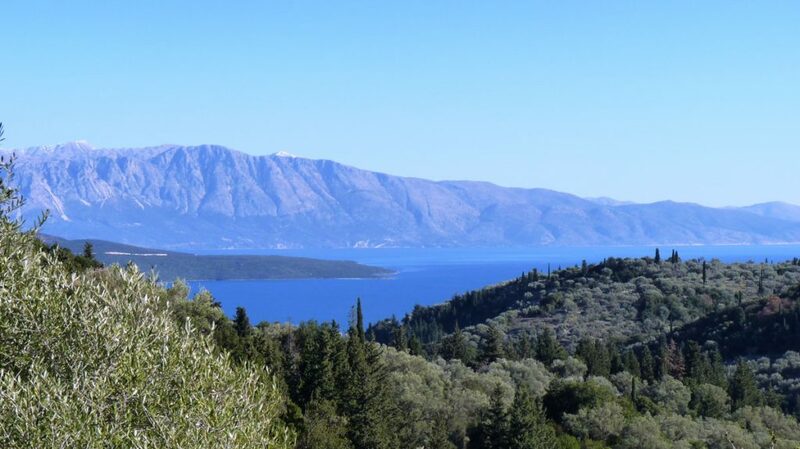 Lunch will be at Maria’s taverna in Kolivata (or in Nikiana). 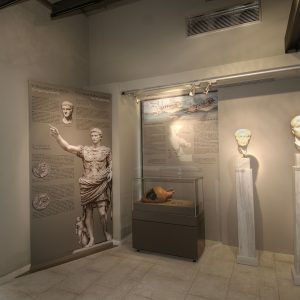 Visit to the archaeological site and museum of Nicopolis, this is the city that Emperor Octavian Augustus founded to celebrate his victory over Anthony and Cleopatra at the battle of Aktium. 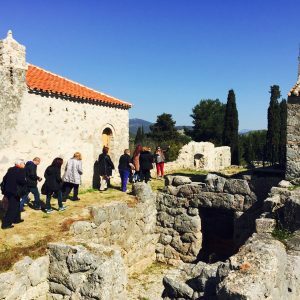 We then go on to the archaeological site of Nekromanteion, where according to the Homeric tradition, stood the gateway to the underworld and the oracle through which the faithful could communicate with their loved ones that had passed away. 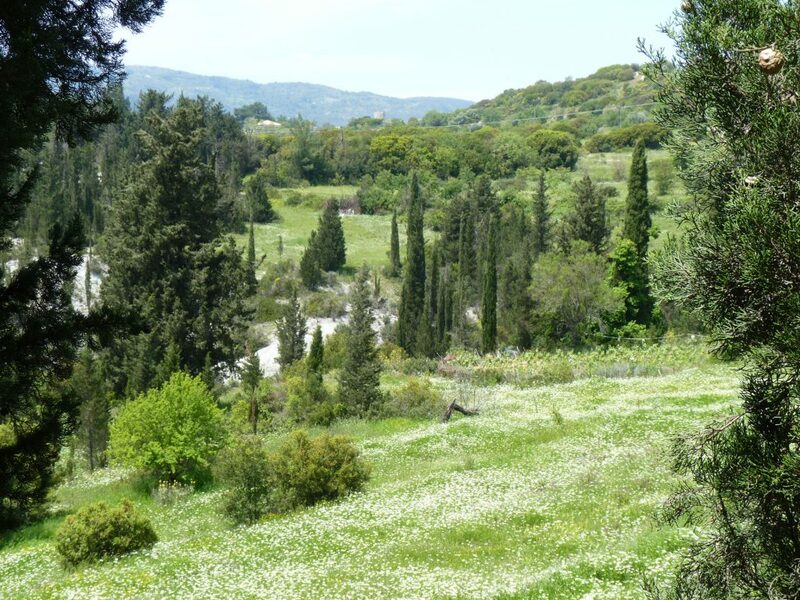 Next is an environmental visit to the springs of Acheron, the river that led to the gates of Hades. 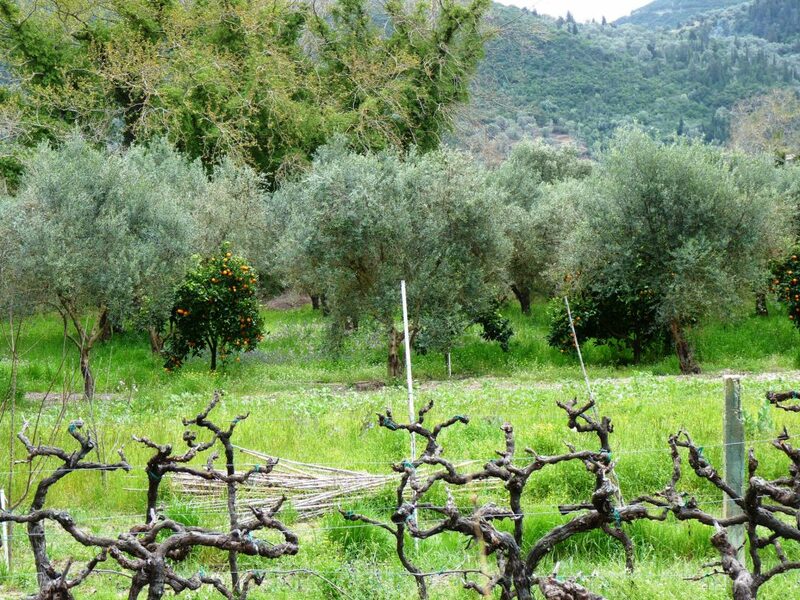 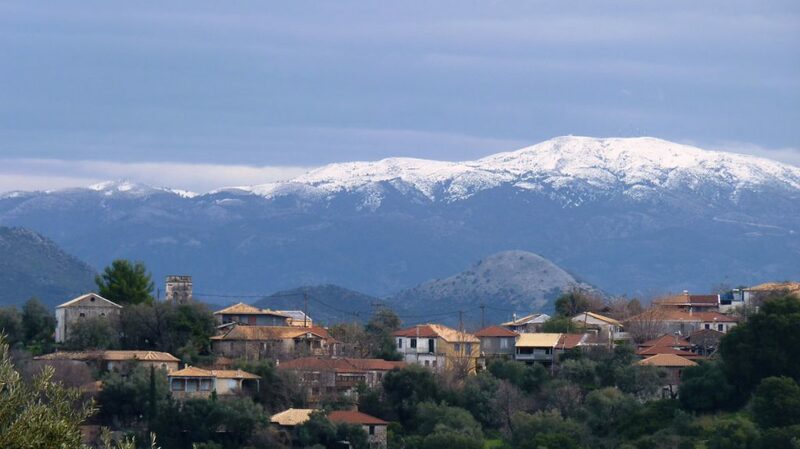 Acheron today constitutes an area of outstanding natural beauty. 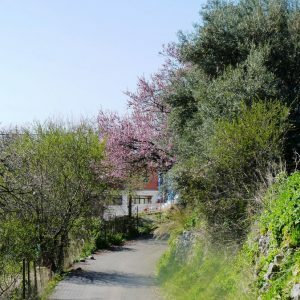 You will have lunch in a local taverna and have time to take a walk along the river, threading your way through plane trees which line the river’s edge. 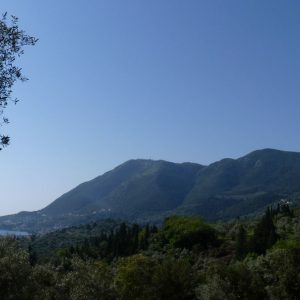 Later in the afternoon you will make your way back towards Preveza and on to Lefkada. 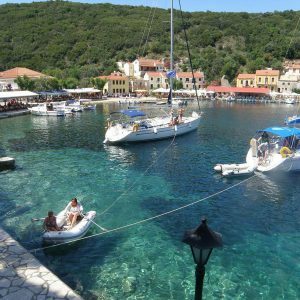 This walks starts in the east coast village of Vlicho which sits at the water’s edge of Vlicho Bay. 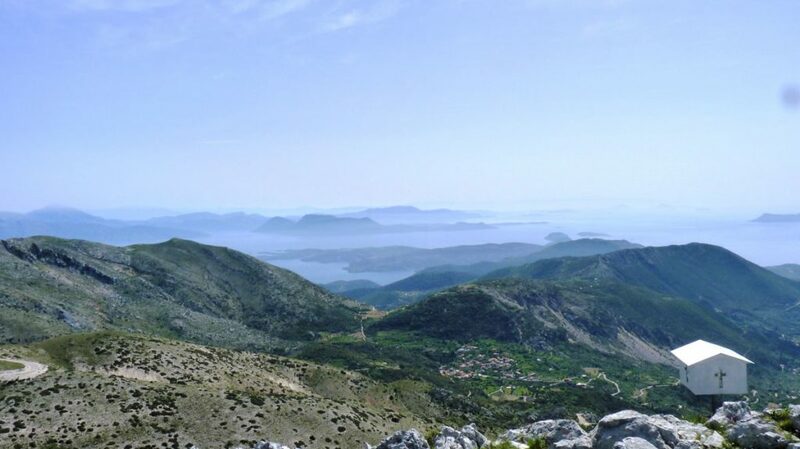 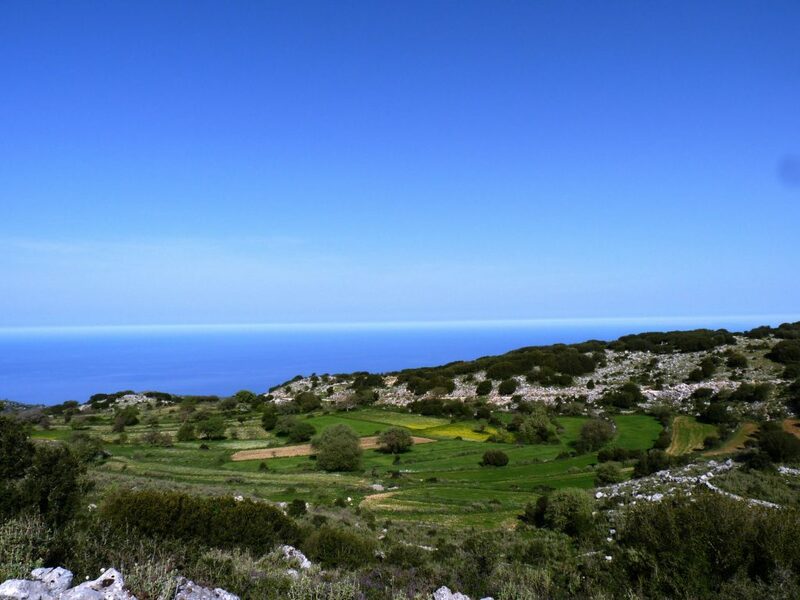 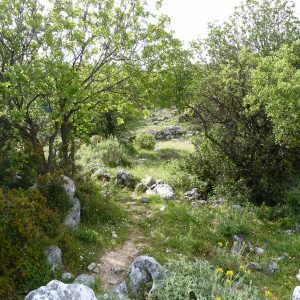 The walk then climbs up the mountain side via an old monopathi (footpath) passing through another 2 villages and gives beautiful views of the east and south coast of the island. 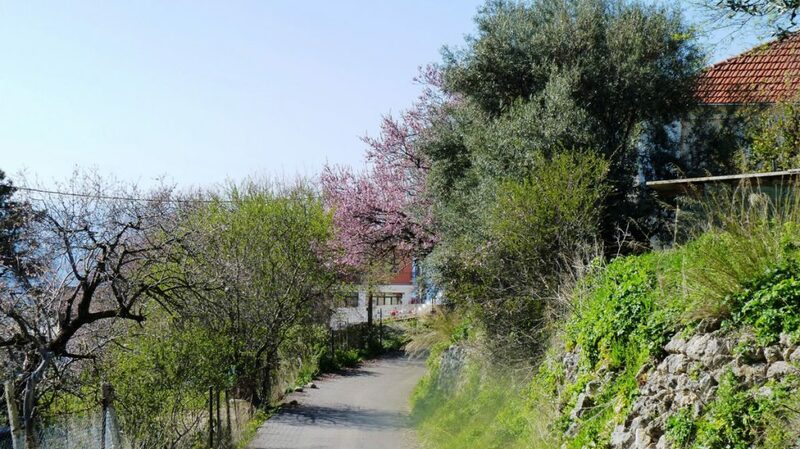 We begin by walking along the road through the centre of the village before we cross the main road and join tracks that climb up through olive groves. 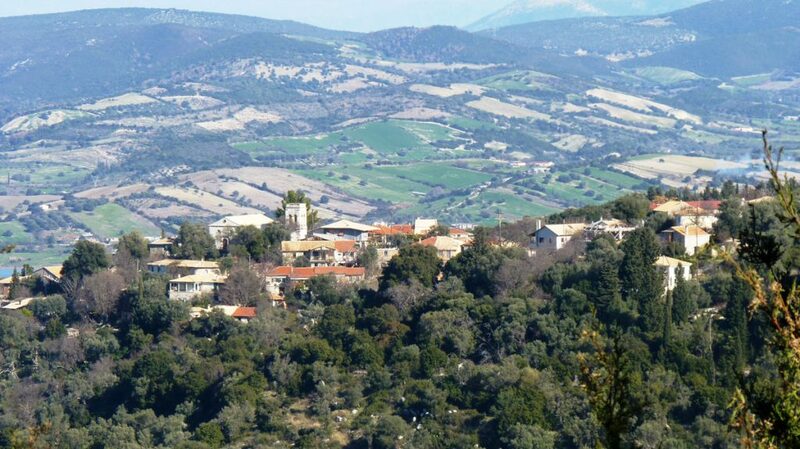 We pass below the village of Katohori and then on up to the village of Fterno via an old monopati. 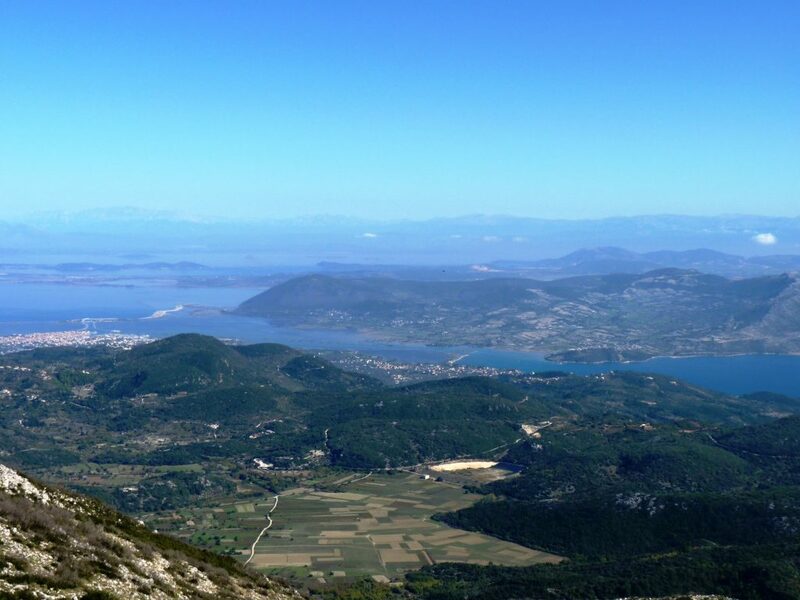 The track then takes us past farms and fields with views of Vlicho bay and the mainland mountains. 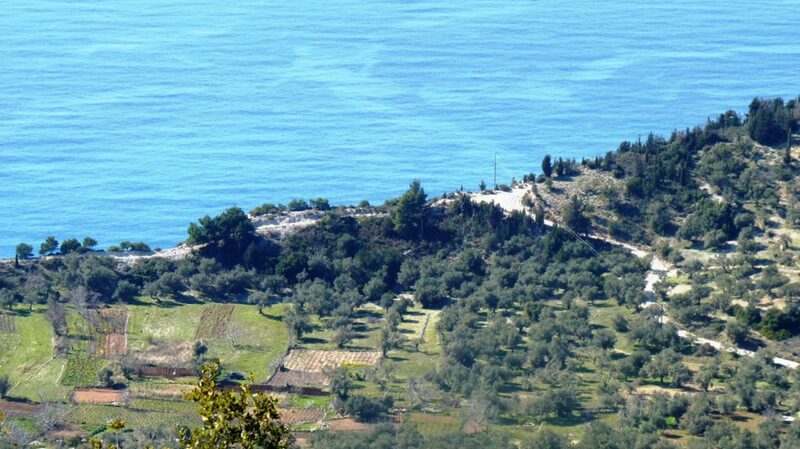 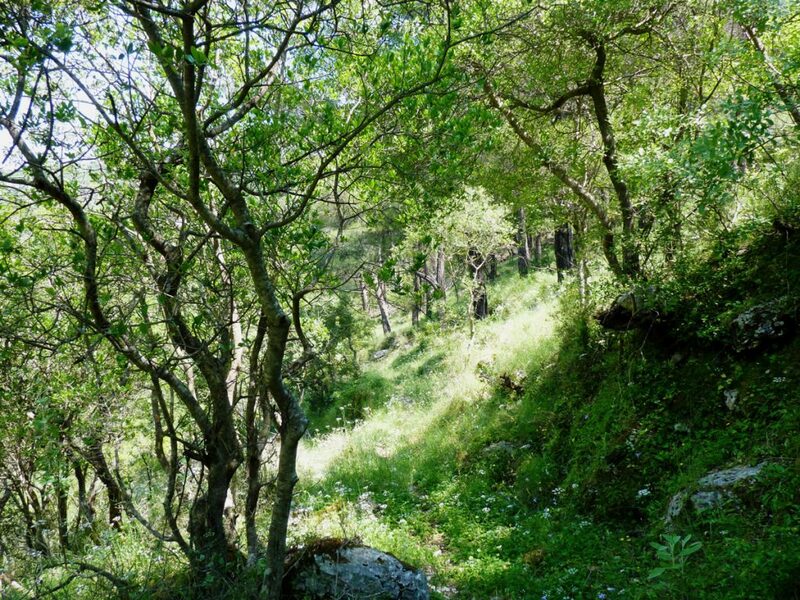 We then begin to descend through pine trees and olive groves and eventually come to the village of Haradiatika. 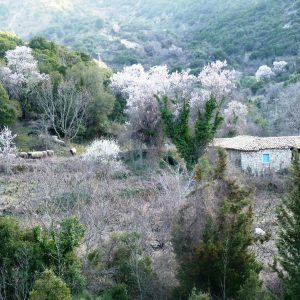 From here we wind our way down the old road and tracks following a river bed and descend back to where we started opposite the old traditional boatyard of Vlicho village. 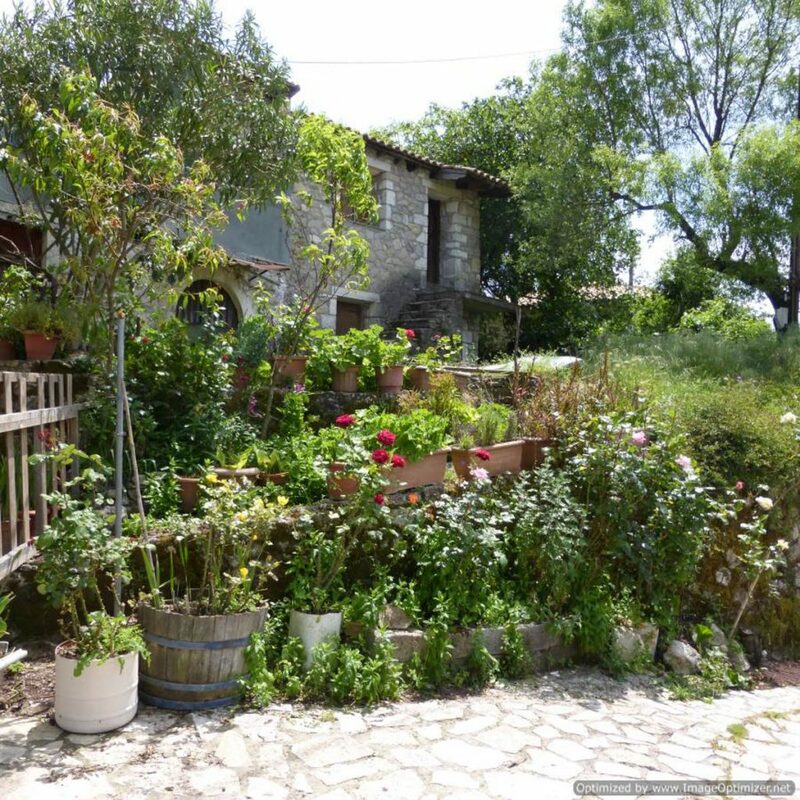 A dinner will be cooked and served at the house this evening. 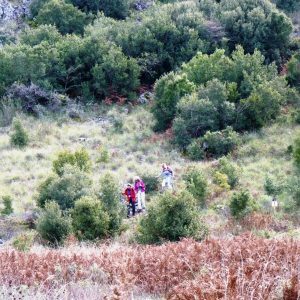 The hikes offer a moderate trek with a maximum of 6 hours walk on sometimes rocky footpaths, and therefore require a medium level of fitness as there are ascents of up to 30 minutes on occasion. 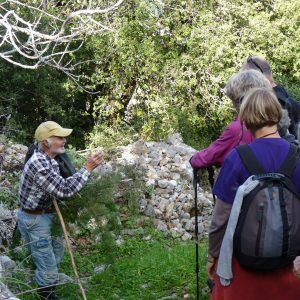 On you arrival you will be welcomed by the owner and your walking leader for an information on your programme for this week. 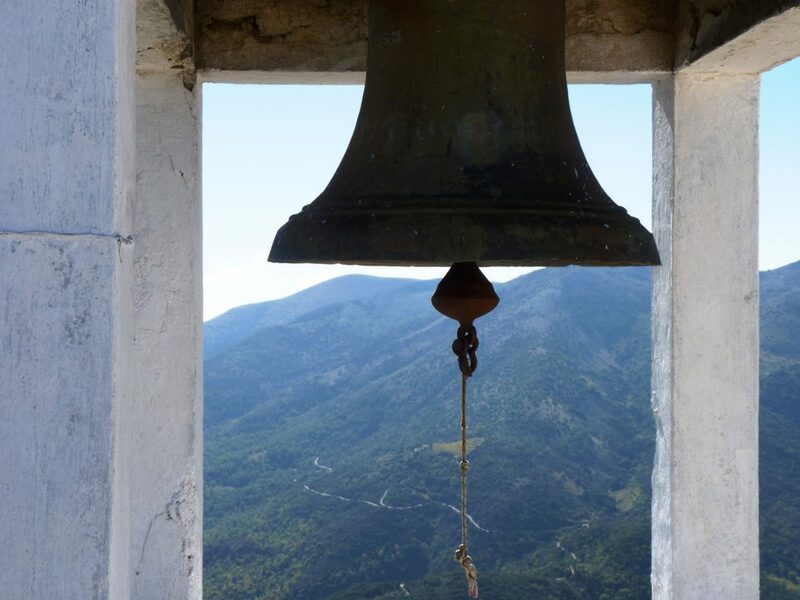 Breakfast is served between 7.30 and 8.15 – Departure from the house is at 8.45 – Walks start at 9.30. 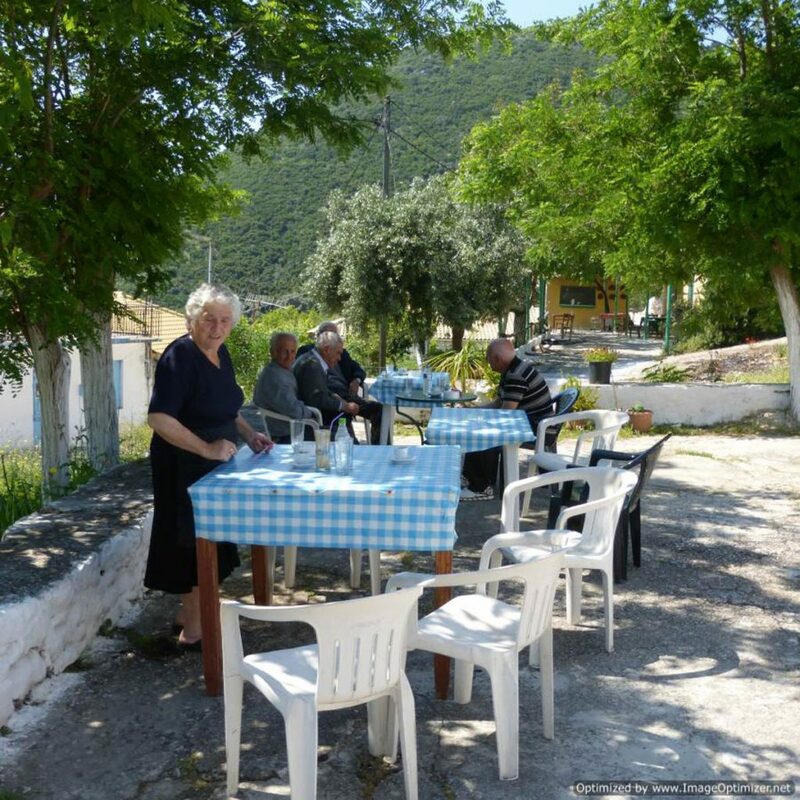 Breaks and lunches are taken on the way or with two of the walks, lunch is at the end in a local tavern. 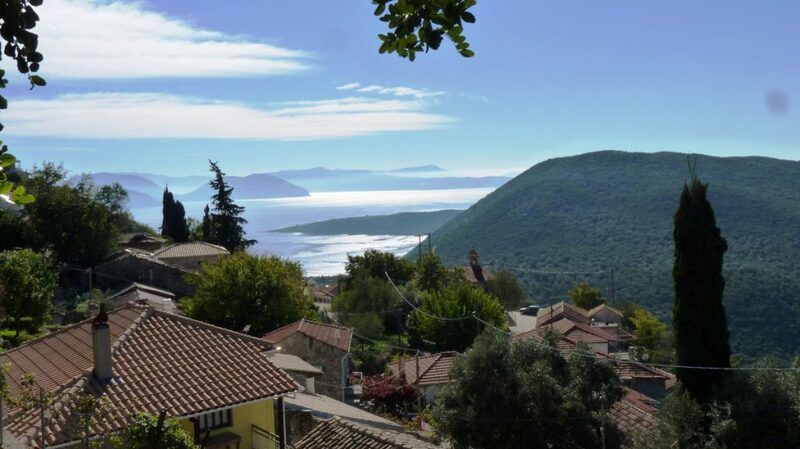 A car hire is necessary for your transfer from and to the airport (distance from Aktio airport to the house: 24km), to the start of all walks and activities, and for your free time. 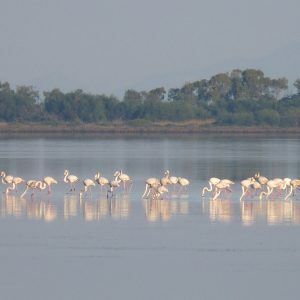 This holiday is arranged and priced around a self-catering 4 bedroom villa for 8 occupants, and includes all breakfasts, some meals, and the activities. 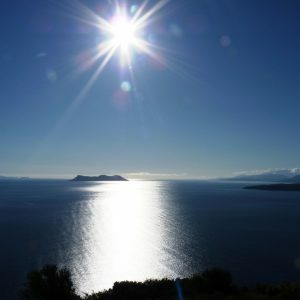 Alcoholic beverages, soft drinks and coffees, personal expenses, everything that is not mentioned in the present description. 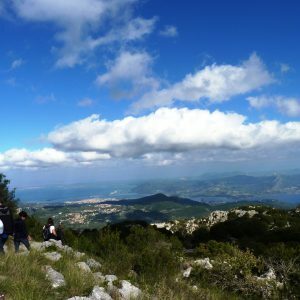 The days in the programme can be changed according to the weather forecast. 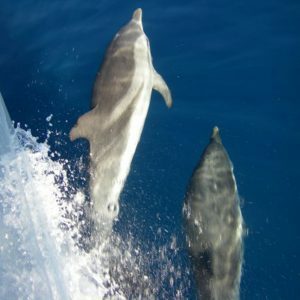 Itineraries can be altered for numerous reasons beyond our control (e.g. 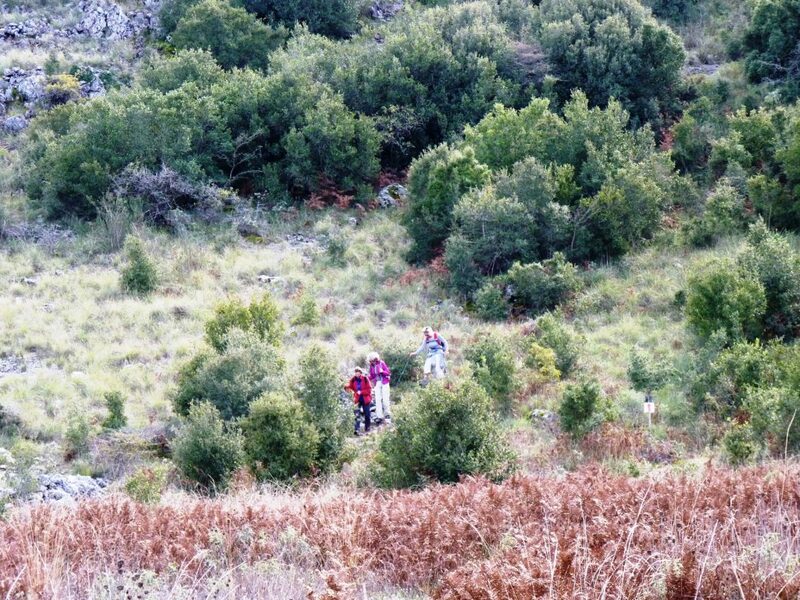 harsh weather, trail conditions) to ensure the safety and the well being of the group. 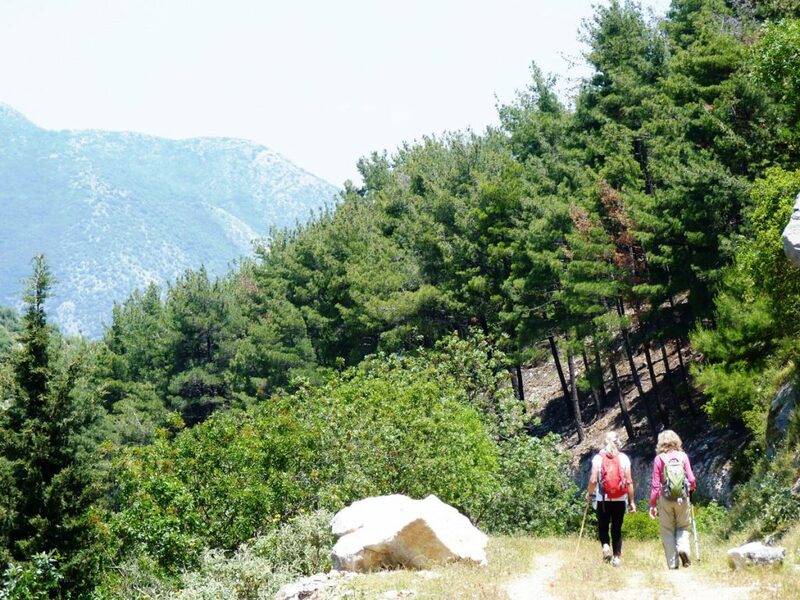 The final hiking selection is left up to the walking leader. 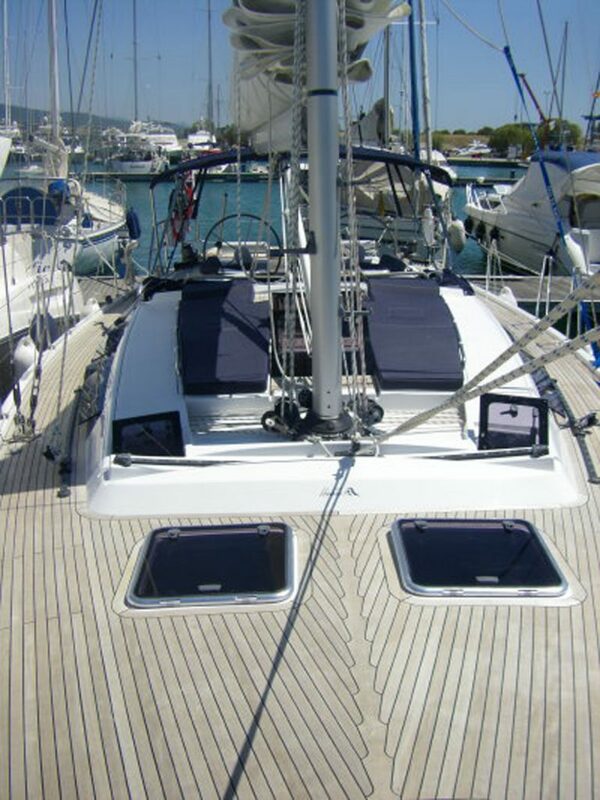 We make all reasonable endeavors to ensure your safety during the activity. 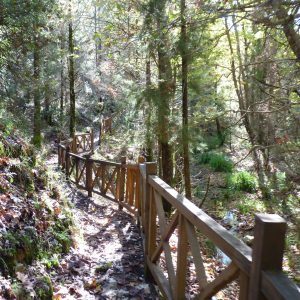 Please note however that your participation in it is entirely at your own risk, and that it is your responsibility to ensure you have an appropriate level of fitness and health, and a proper insurance coverage. 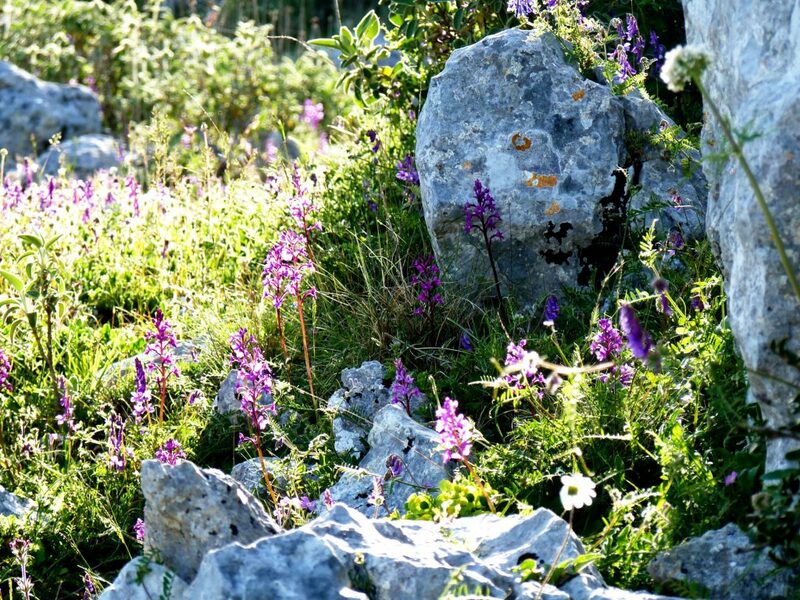 We are not responsible for any accidents or mishaps directly or indirectly related to the tour. 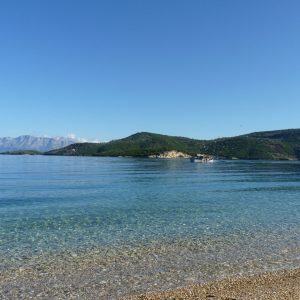 ** we can assist you with your car hire at Aktio airport, you might choose several cars to be independent or if preferred a minibus can be arranged for your group.